grill until char marks visible and slightly cooked (peel skin if desired). Set aside and grill onion slices until slightly translucent. Chop bell peppers and onion. 2. Thread shrimp onto skewers. Lightly brush with olive oil. once liquid is absorbed, stirring in gently. salmon on the grill. 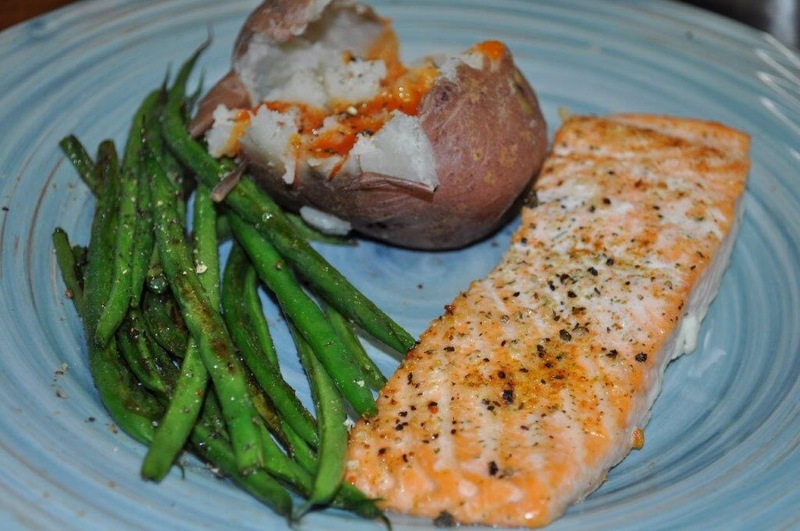 Grill the salmon for about 3-5 minutes per side, chop into chunks and place in large bowl. Grill the shrimp until firm and pink, 1 to 2 minutes per side, remove from the skewers and place in bowl with salmon. 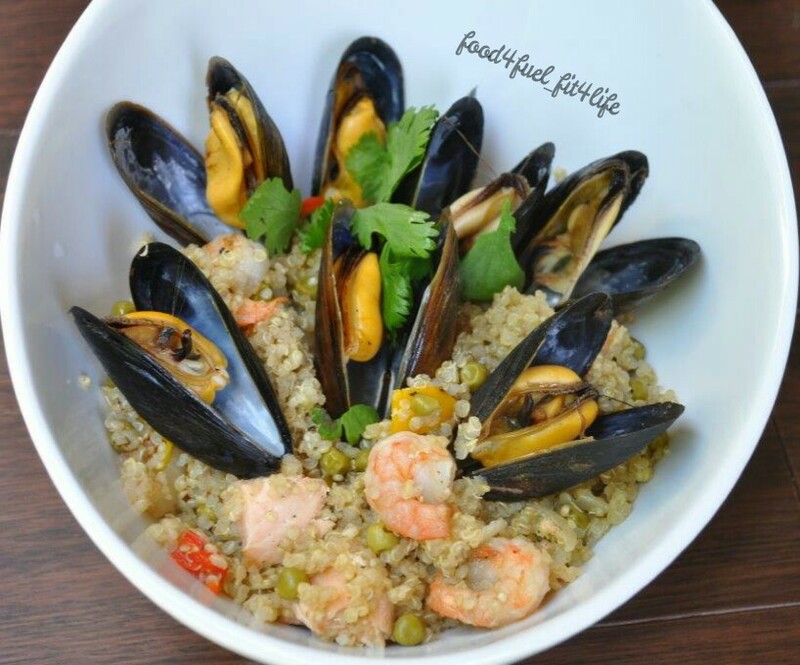 Grill the mussels until their shells pop open, 4-8 minutes total. (Discard any mussels that don’t open.) Set aside. 5. 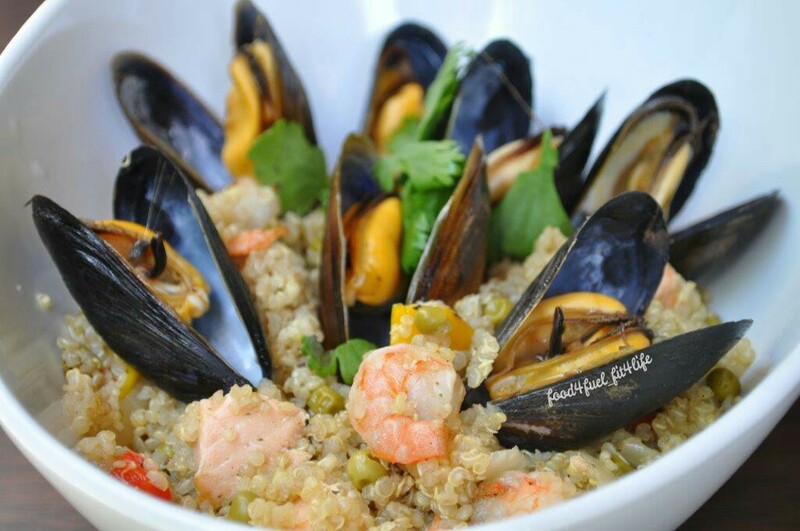 When the quinoa is done, remove from the heat, and add the seafood plus any accumulated juices over the rice, add mussels on top and sprinkle with fresh cilantro. 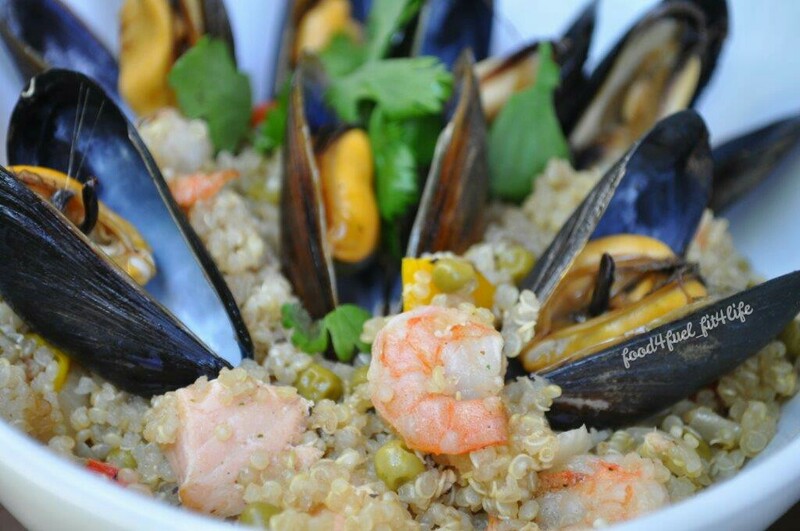 Looking for a way to spice up your quinoa? 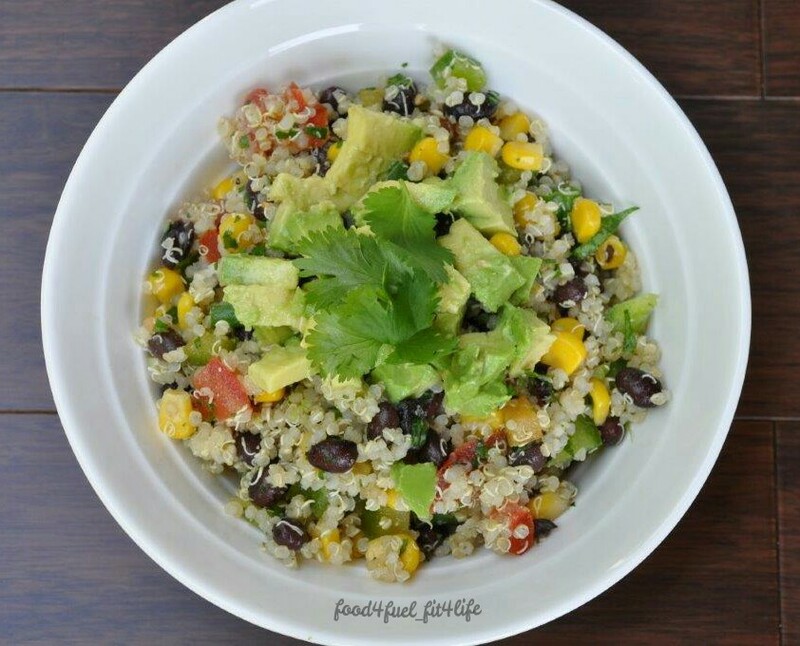 I know it can be pretty bland by itself so I like to mix it into salads or make a large batch and have meal prep done for the week! It is also a great pot luck dish. 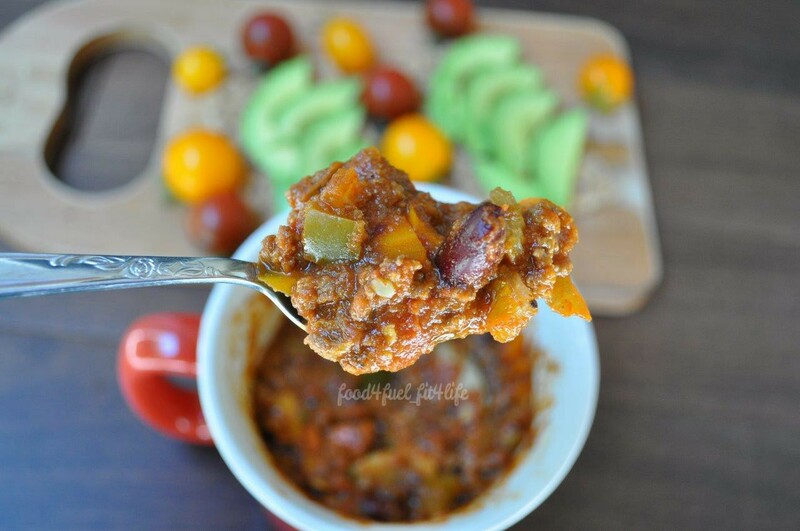 Recipe below! 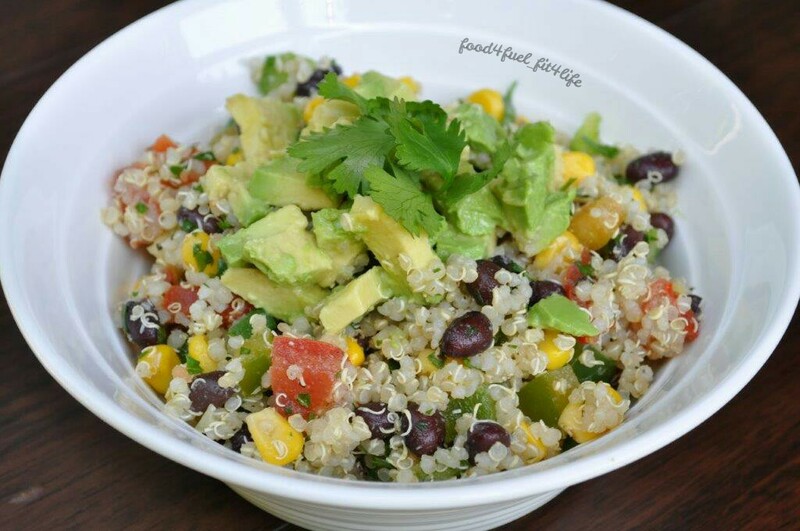 Cook quinoa with water and let cool for approximately 2 hours. 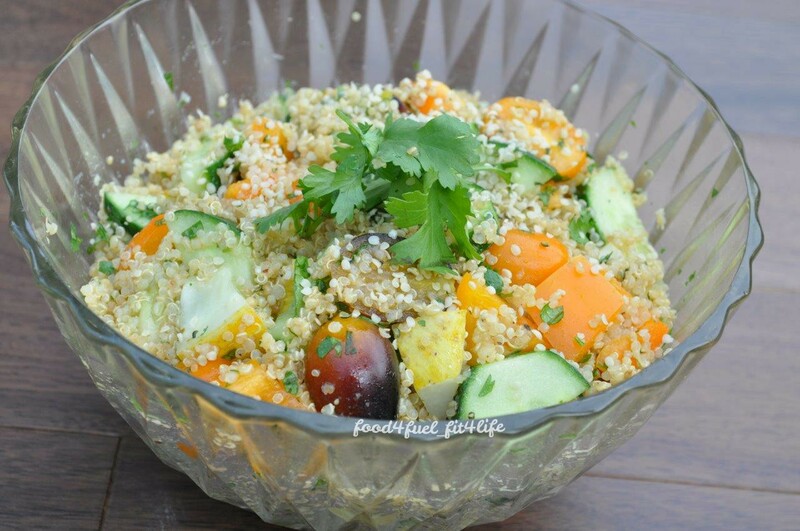 Prepare all vegetables and mix all remaining ingredients together with cooked/cooled quinoa. 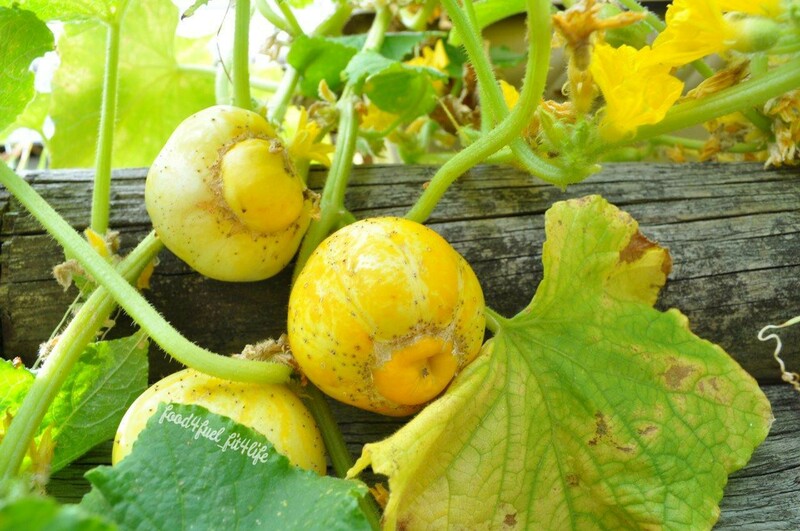 Rest for about 30 minutes or longer for flavours to develop (best overnight). 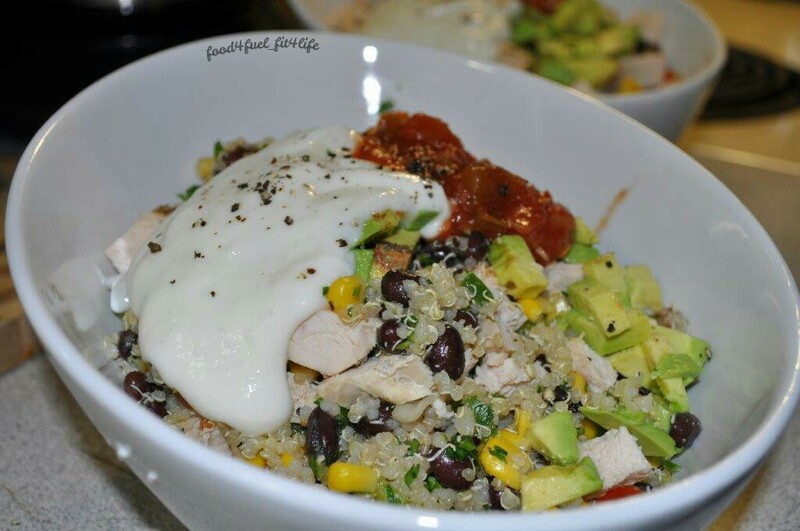 Top with avocado, salsa, greek yogurt, cilantro or whatever you like! Enjoy. Makes a lot! 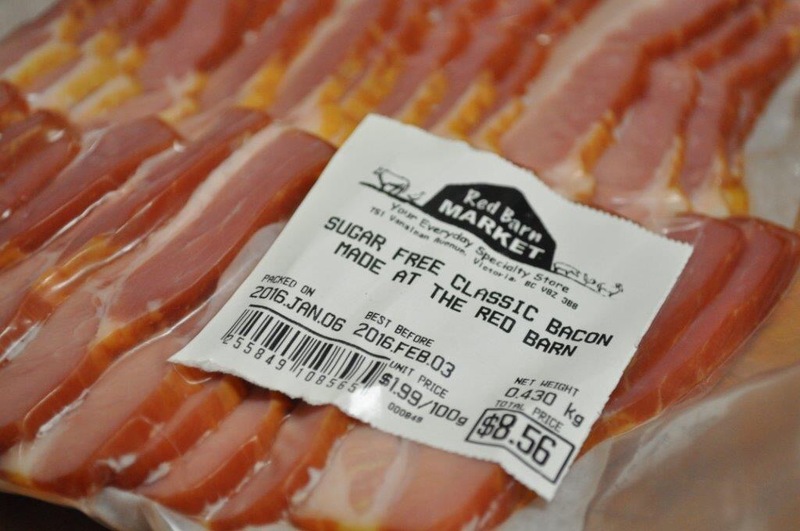 I would say it would make at least 8 servings. 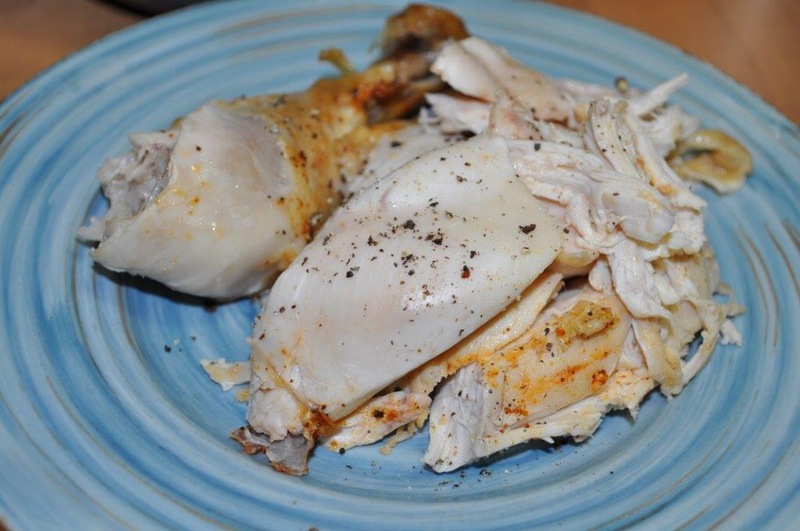 Feel free to add some cooked chicken breast for extra protein! It’s the new year and for the last 2 years every January I embark on Whole30 but this time I am going to blog about it the whole way through! Follow me through if you like. Here we go! Real sick, feeling it from overindulging in the tequila the night before 😷 Ready to ditch the booze, sugar, dairy, grains and legumes from my diet! Let’s do this! 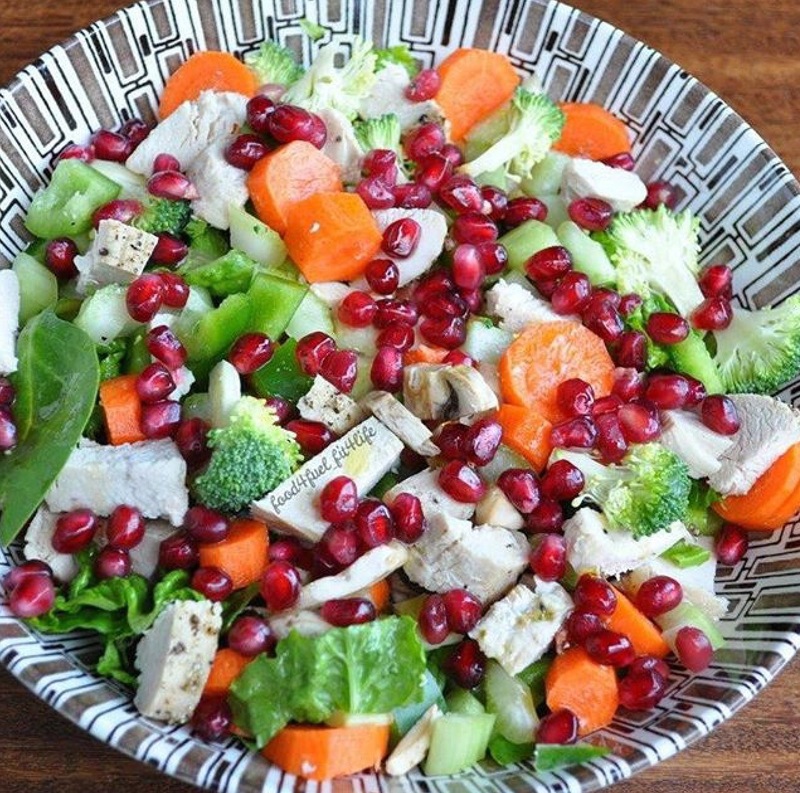 Meal 2: Chicken breast, Green tossed salad with pomegranate arils. Tossed in 2tsp extra virgin olive oil and 1/2 squeezed lemon. 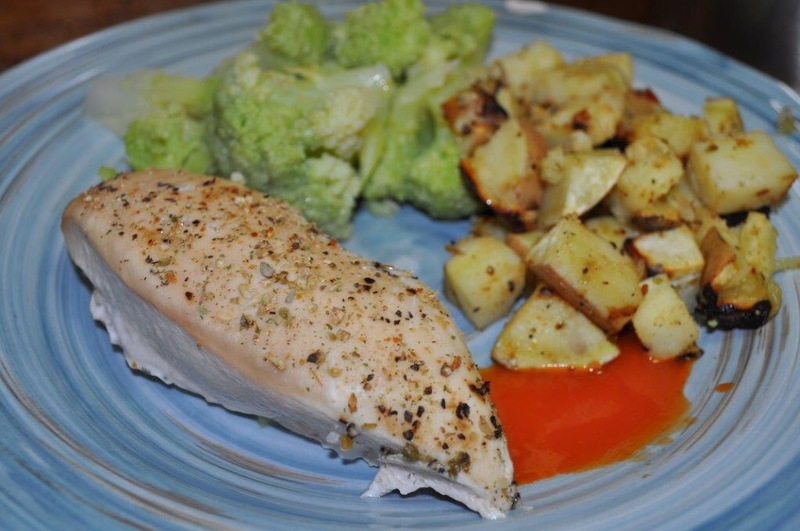 Meal 3: Baked chicken, baked cubed yams, broccoli with ghee. Feeling somewhat better and ready to eat some whole food! 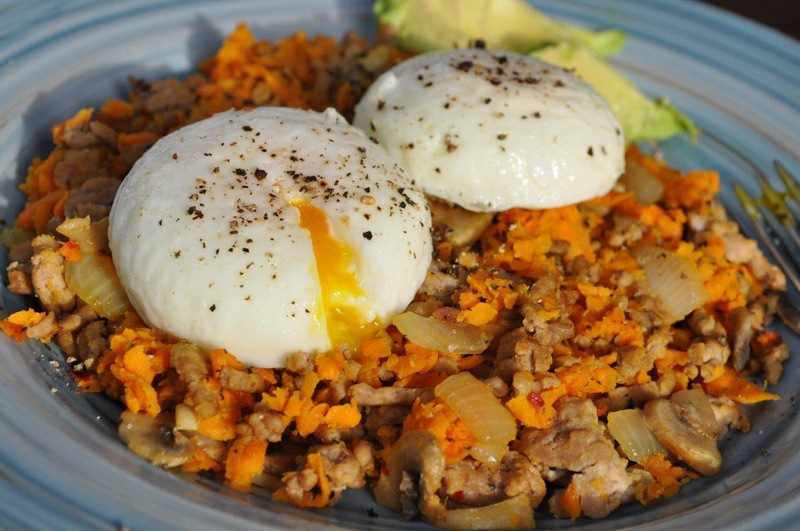 Meal 1: Sweet potato and pork hash, 2 eggs, 1/4 avocado. Meal 2: Carrots & celery sticks with homemade guacamole and chicken breast. Feeling full of energy today, tiger blood is creeping up. 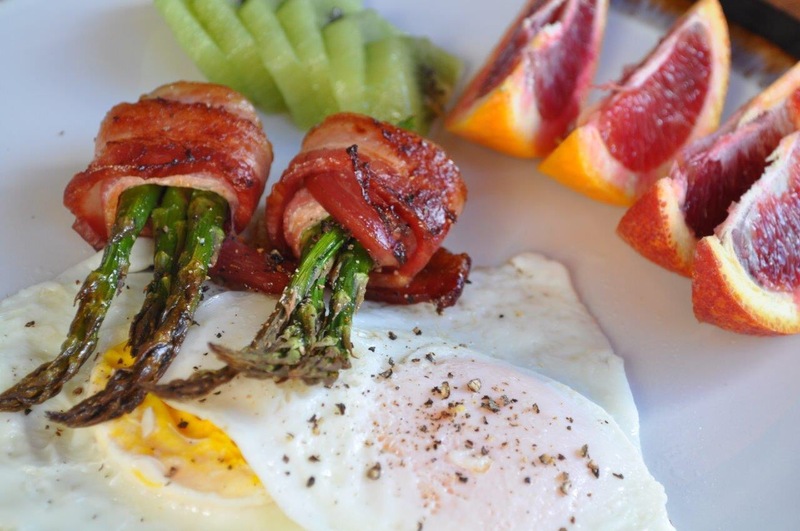 Breakfast then out for some Whole30 essentials. 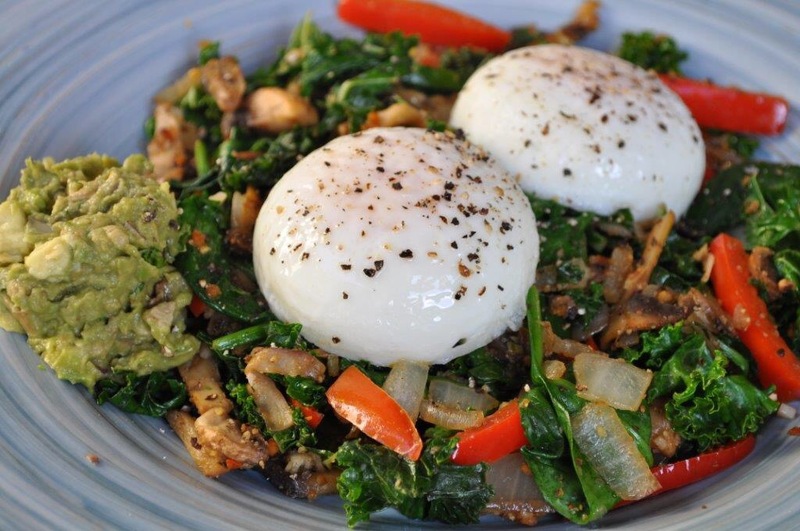 Meal 1: Sautéed mushroom, onion, bell pepper, garlic, kale & spinach with coconut oil and herbs. 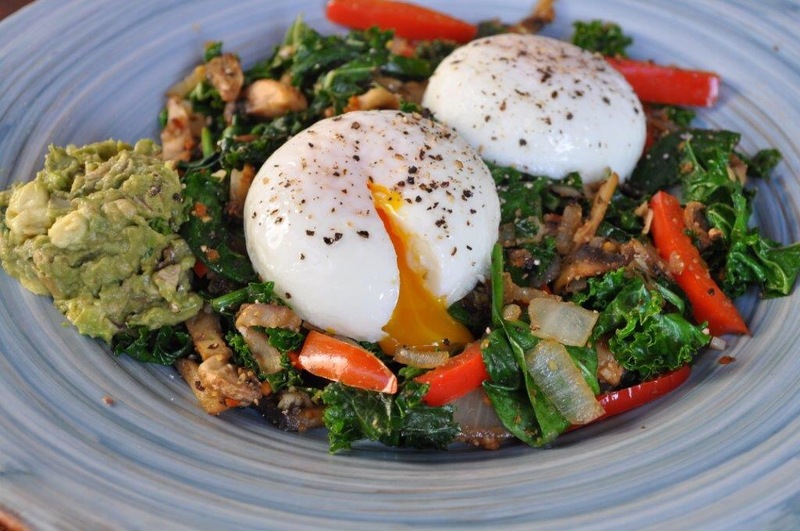 Topped with two poached eggs and side of guacamole. I had some guava Kombucha while out shopping too. Snack: Chia pudding with mashed raspberries, banana, sprinkle of hemp hearts, bee pollen, coconut. 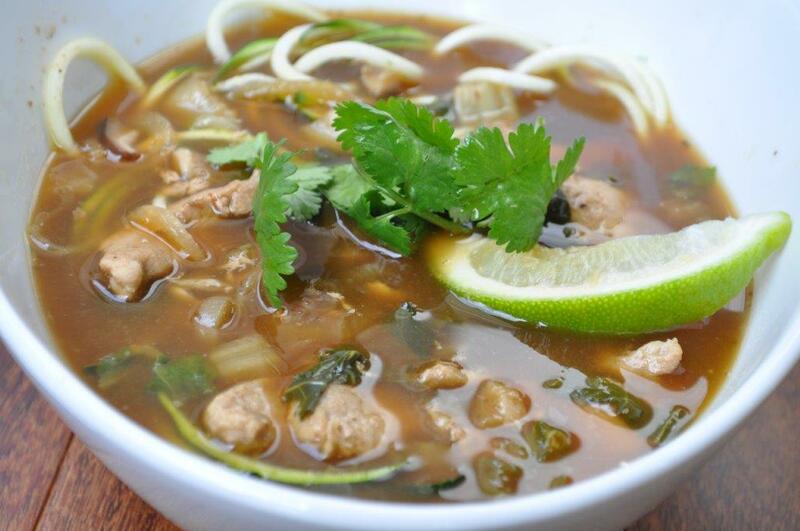 Combine all ingredients and stir well, soak for 2 hours. Meal 3: Italian sausage potato skillet. 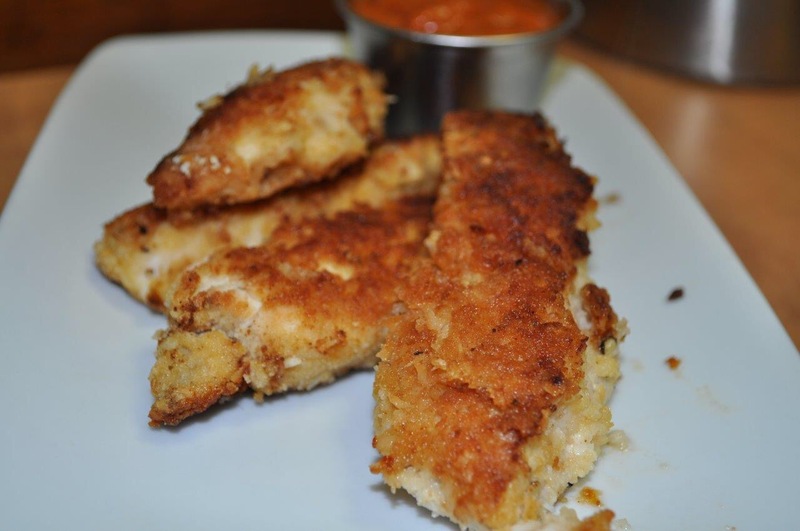 Italian seasoning (1tsp basil, 1tsp oregano, 1tsp parsley, 1/4tsp red pepper flakes, 1/2tsp garlic, s&p) Save leftovers. Prepare Italian seasoning in small dish. Cook sausage over medium heat in frying pan, slice and brown more. 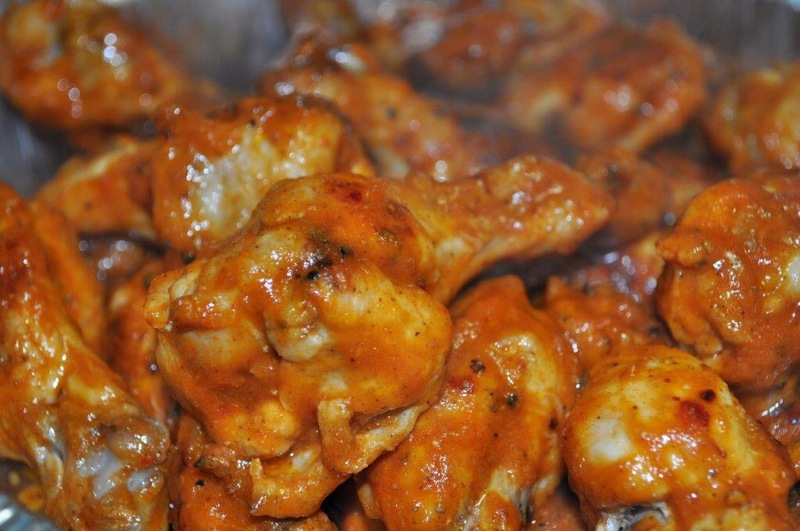 Remove from pan and set aside on paper towel. 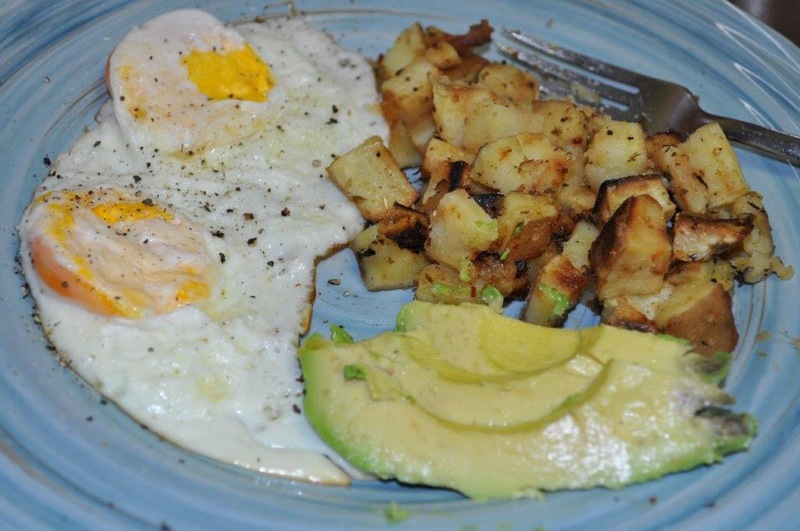 Slice potatoes, add some coconut oil to pan over medium heat and place potatoes evenly on pan. Brown both sides of potatoes evenly; seasoning each side with Italian seasoning (cooking the potatoes before hand helps or microwave for a few minutes then slice). While cooking potatoes start to chop veggies. 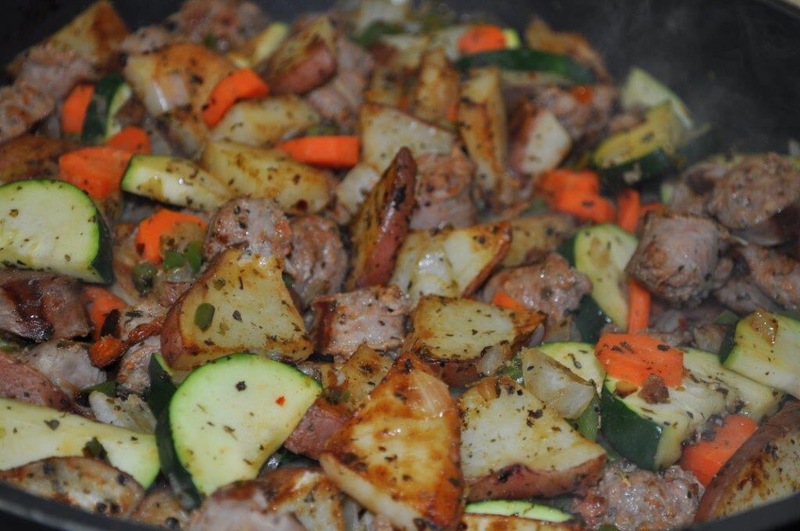 Add veggies to skillet once potatoes fully browned on both sides, add some more Italian seasoning and cook until zucchini tender, add sausage and cook for about two minutes more. 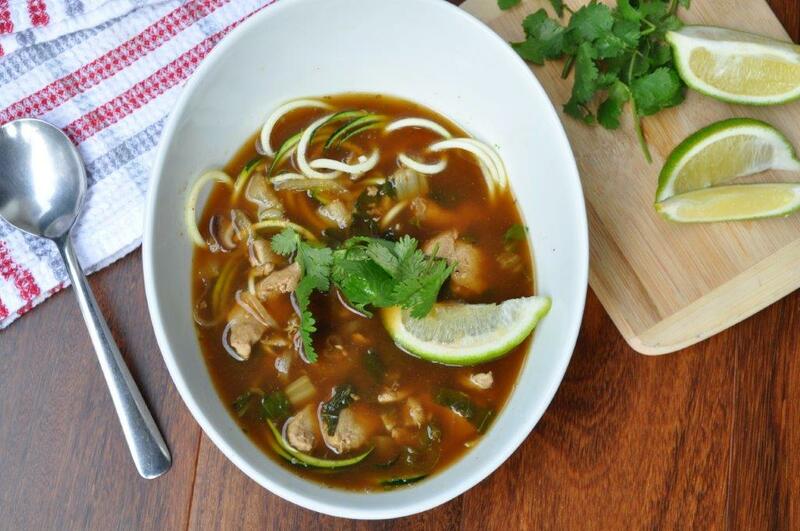 Serve with Whole30 approved hot sauce, cilantro and sesame seeds (optional). Doused mine in some Yucatan Sunshine hot sauce. Essentials picked up today. 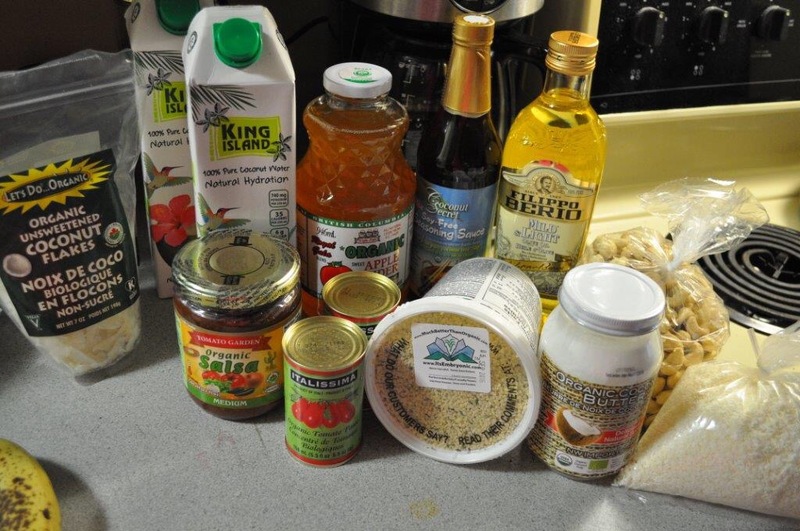 Coconut flakes, coconut water, whole30 approved salsa, apple cider & tomato paste for ketchup, coconut aminos, hemp hearts, light olive oil for mayo, cashews, coconut butter (manna) and shredded coconut. 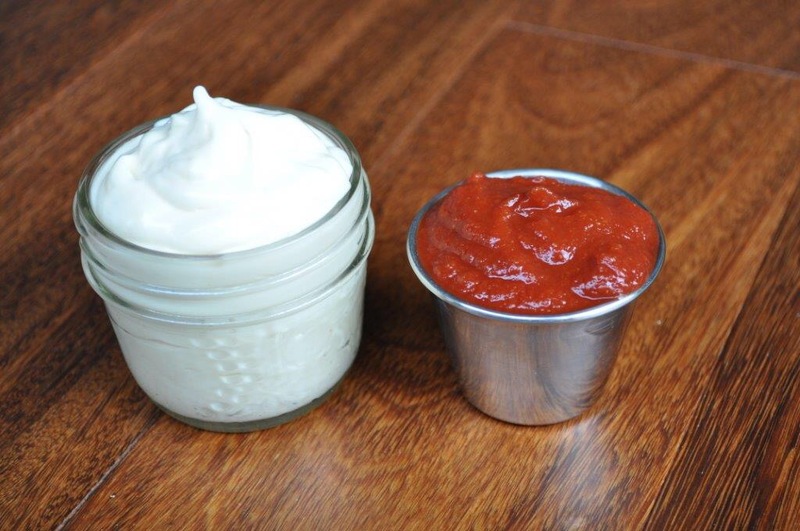 Time to make ketchup and mayo! 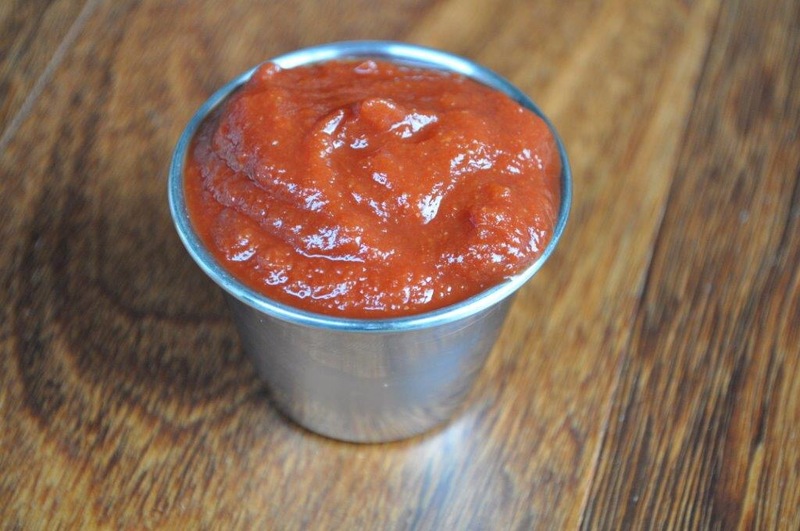 All you need to make ketchup. 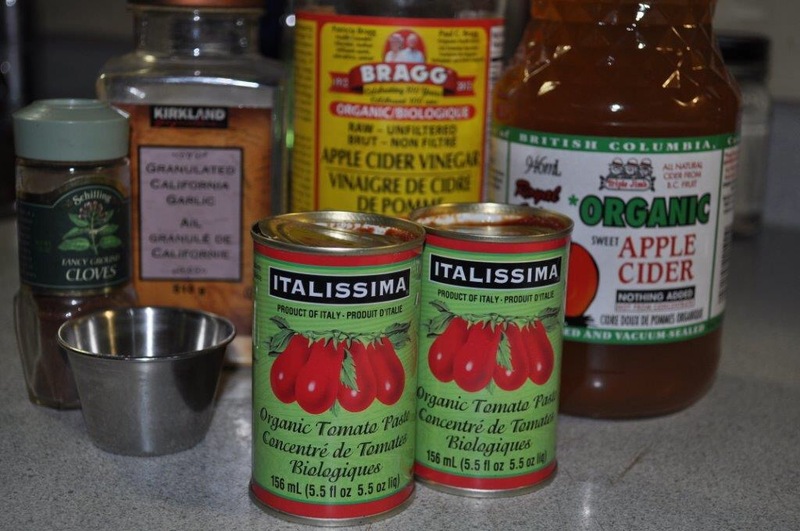 2 cans tomato paste, 1/2 cup Apple cider, 1/2 cup Apple cider vinegar, 1tsp garlic powder, 1/2 tsp Himalayan salt, 1/8tsp ground cloves. 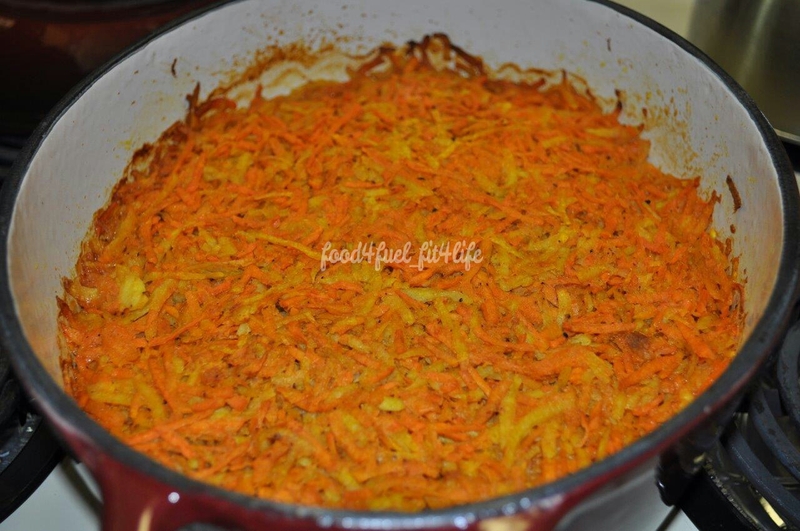 Bring to a simmer over medium heat for about 10 minutes stirring constantly. Woke up not tired at all and the headache is gone, feeling full of energy. Started a new workout program and felt great at the gym other than it was absolutely packed due to New Years resolutioners’ … Guess you gotta start sometime and January seems to be it haha! Anyway here are today’s meals. 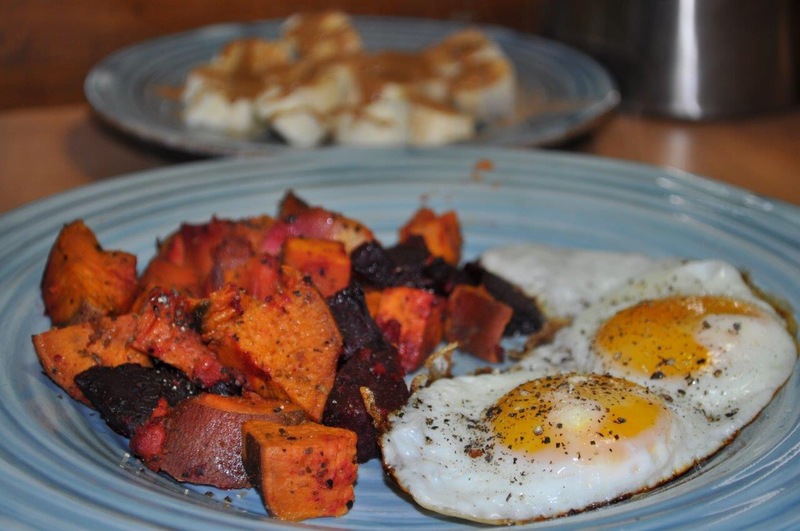 On Sunday’s I usually prep roasted root veggies and chicken breast for the week so I can easily grab for breakfasts and lunches, I will share this Sunday with you more on what I do. 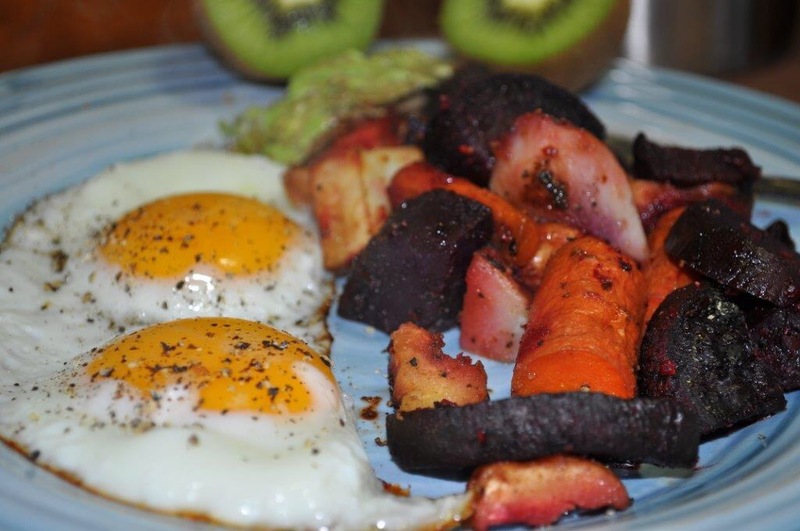 Meal 1: roasted root vegetables, two fried eggs, 1/4 avocado, 1 kiwi. 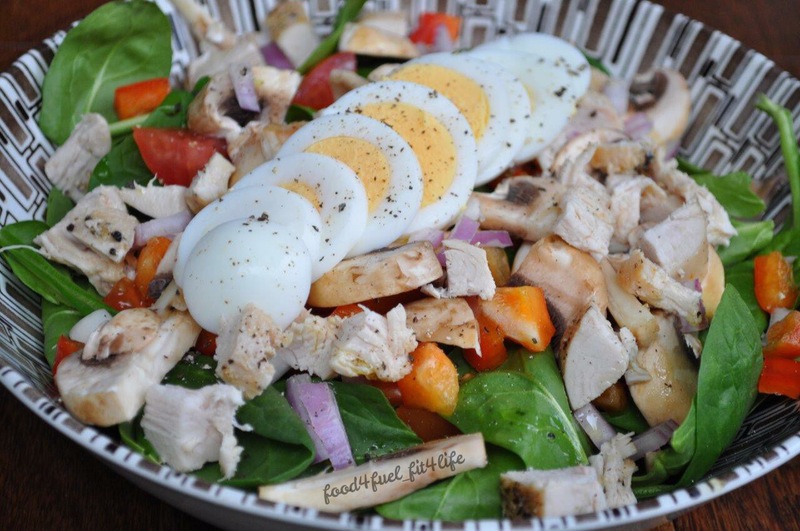 Meal2: Spinach salad with bell peppers, red onions, tomato, mushroom, cooked chicken breast, one hard-boiled egg. 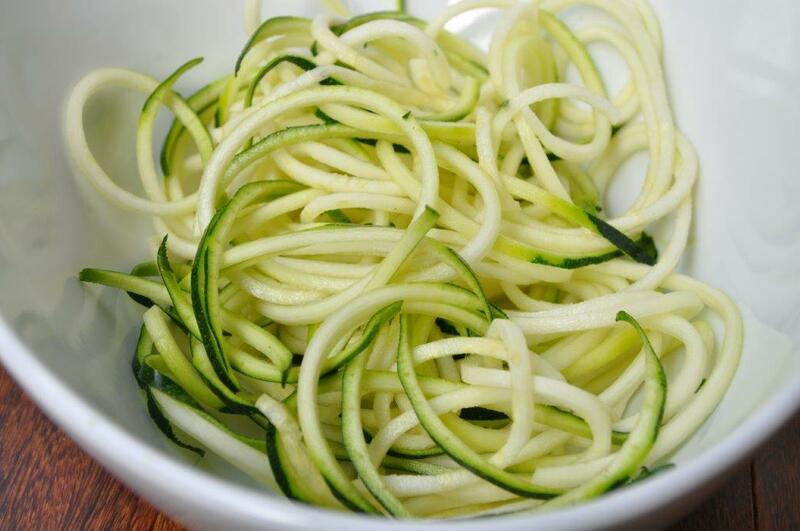 Tossed in 2 teaspoons extra-virgin olive oil and one tablespoon apple cider vinegar. Side of pineapple. Snack: Apple & almond butter. 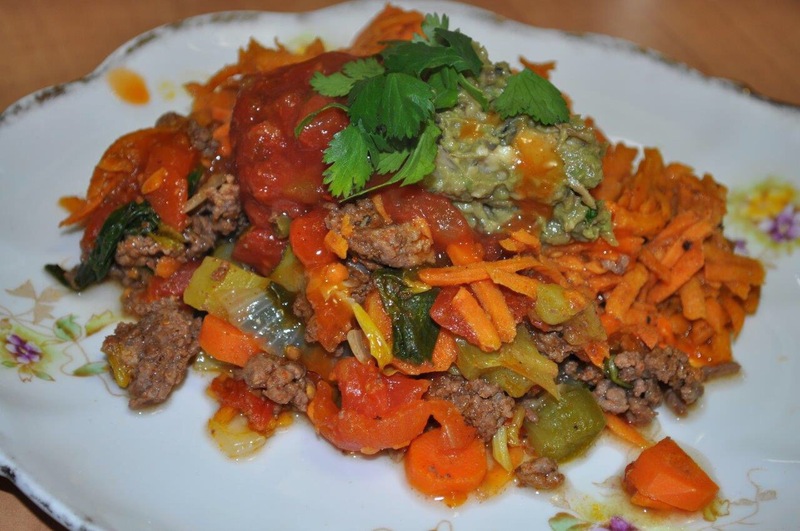 Meal 3: Tex-Mex Casserole topped with Whole30 approved salsa, guacamole, hot sauce and cilantro. 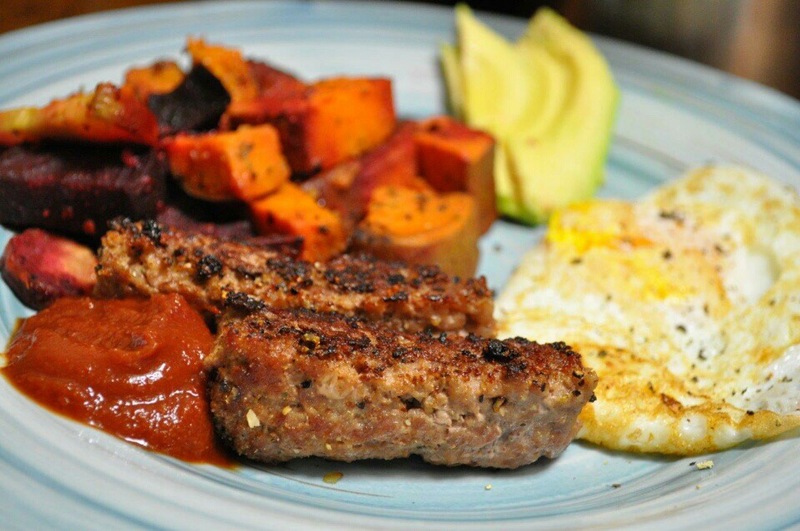 Recipe here from my previous Whole30. Sleepy today but had enough energy to get myself to the gym do the rock bottom class then shoulders/chest/triceps. Lazy food day, love leftovers! 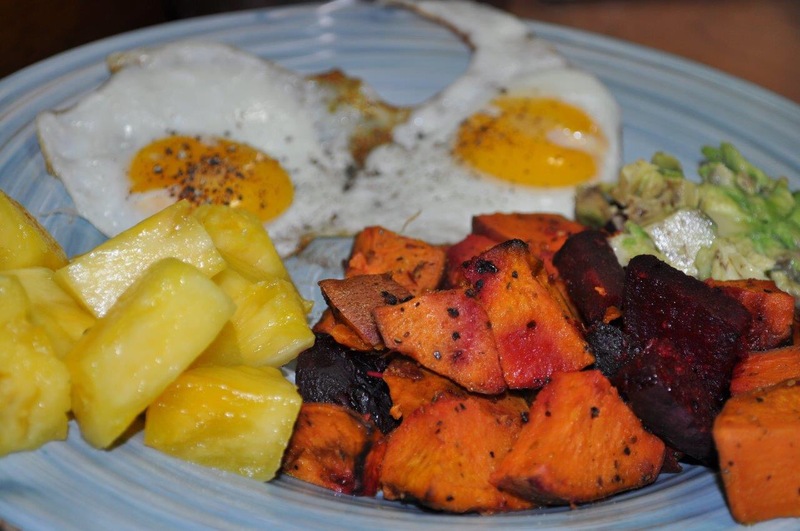 Meal 1: Roasted root veggies, 2 eggs, avocado & pineapple. 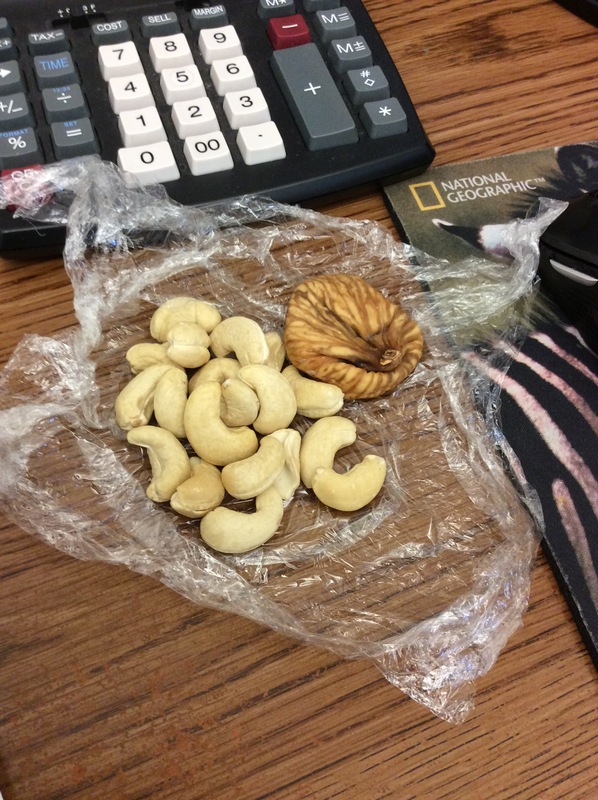 Snack: Hard boiled egg & handful cashews. Still tired this morning but had a 45min nap after work because I felt that I needed it. Active rest day so I did tabata. Here are my meals for the day. 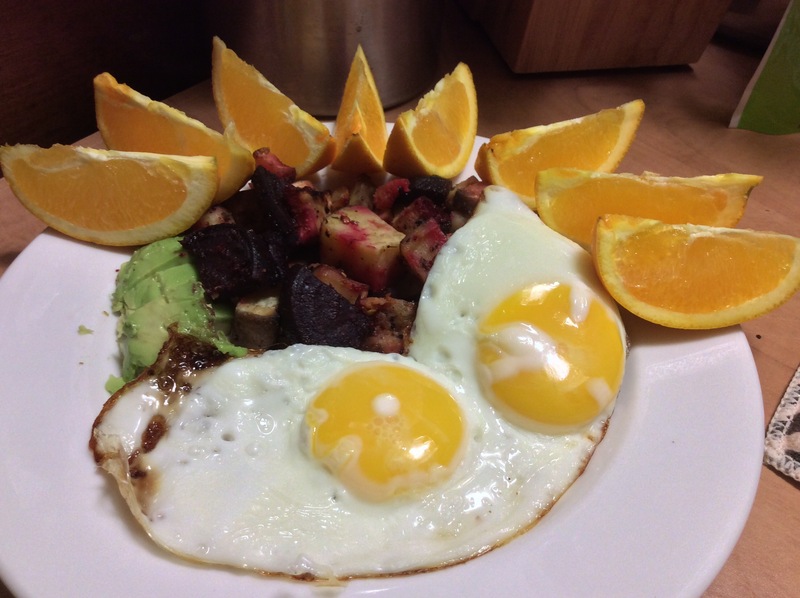 Meal 1: Roasted root veggies, homemade sausage, over easy egg, avocado. 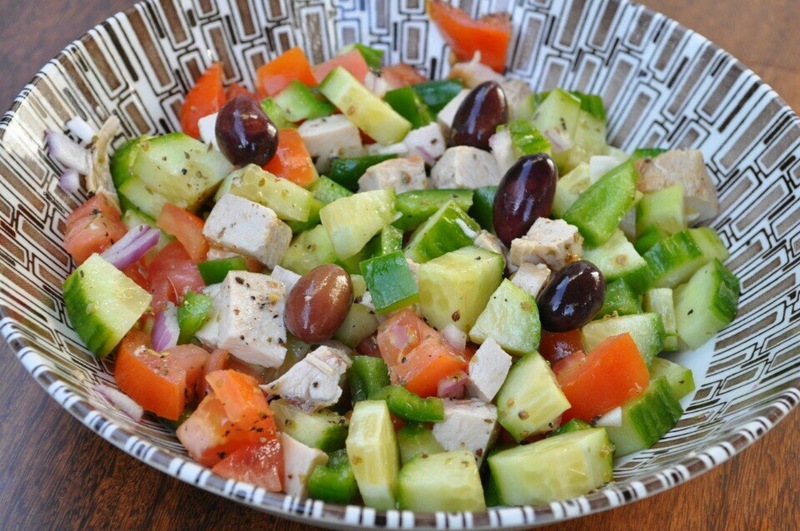 Meal 2: Chicken Greek salad tossed with extra virgin olive oil, Apple cider vinegar & oregano. 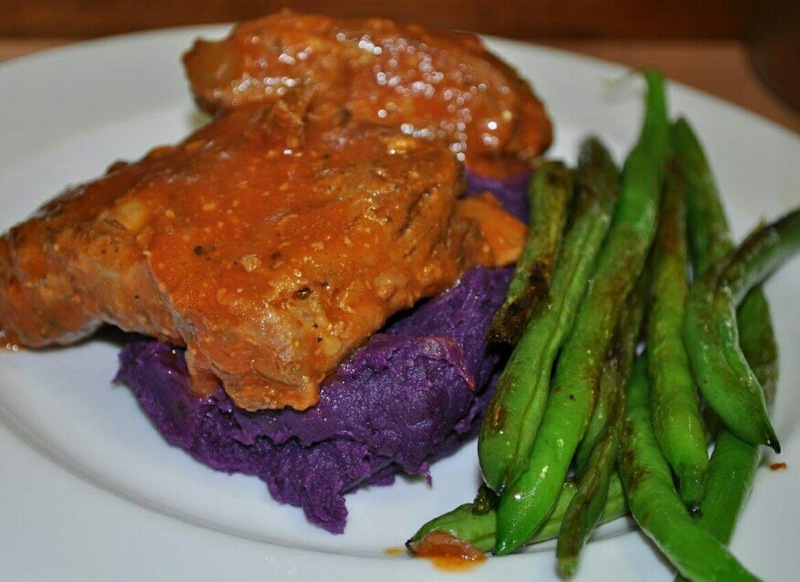 Meal 3: Slow cooker ribs with homemade sauce, mashed Chinese purple yams, green beans with ghee and garlic. Didn’t sleep the greatest, woke up a couple times through the night but was able to fall back asleep and I’m having some crazy dreams. I woke up 30 minutes before my alarm went off and felt energized, time for breaky! 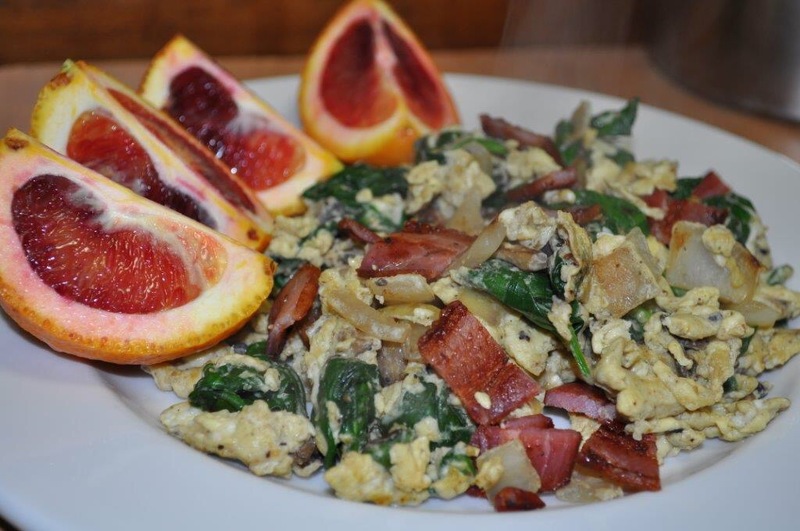 Meal 1: Scrambled eggs (1 egg/2 egg whites), mushroom, spinach, onion and sugar/nitrate free bacon! 1 Blood orange. Meal 2: Leftover ribs & last of Tex mex casserole. It was leg day needed the fuel! 1 week down, week 2 here we go! Little tired again today and really sore from yesterday’s workout. Glad it’s Friday! 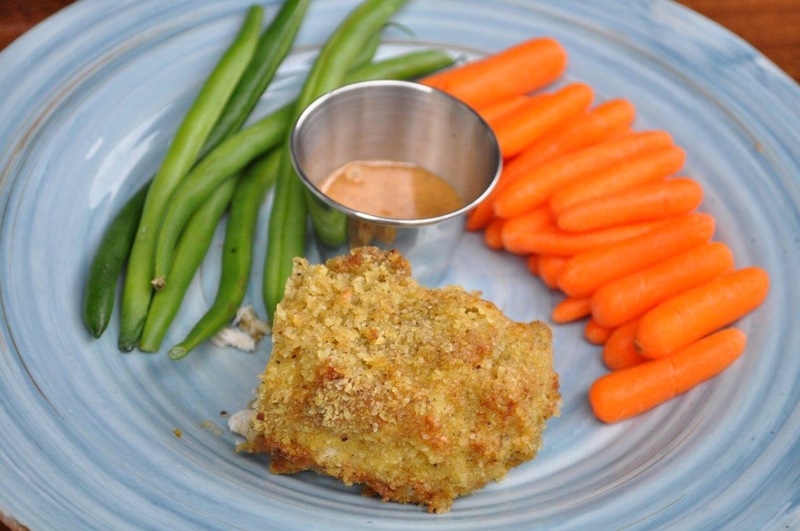 Meal 2: leftover almond chicken, carrots, green beans, almond butter. Today’s first test; went to a funeral and reception food! I succeeded. Tough day. Meal 2: (on the road) 2 hard boiled eggs, blueberries, carrots & green beans. Also had some veggies and olives at reception. 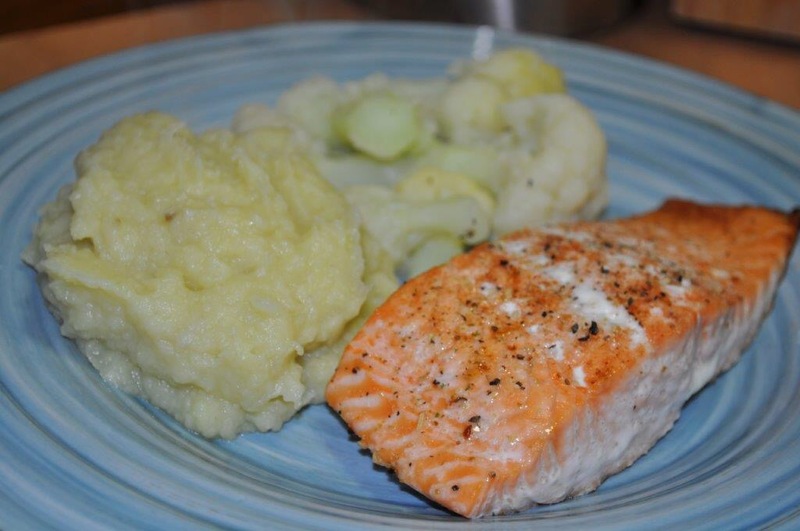 Meal 3: Salmon, whipped sweet potato with ghee, cauliflower. Slept in and feel great today! Went to the gym and did my regular shopping and meal prepping. 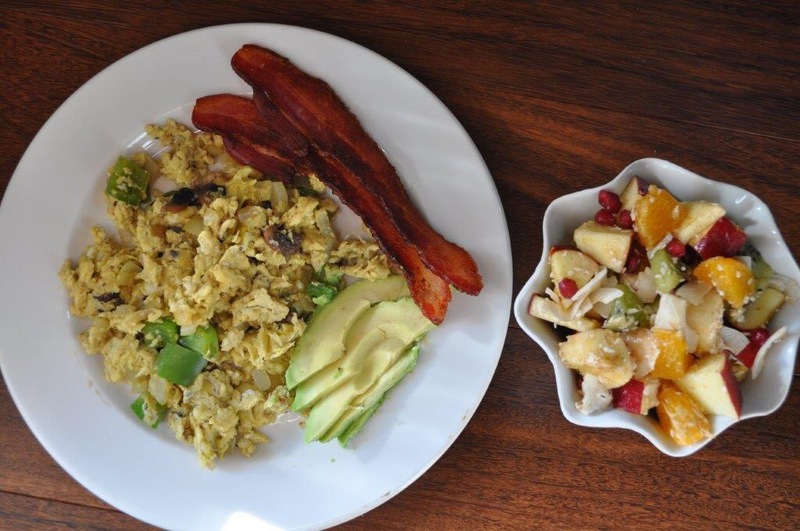 Meal 1: Scrambled eggs with mushroom, onion and green pepper, bacon, avocado. 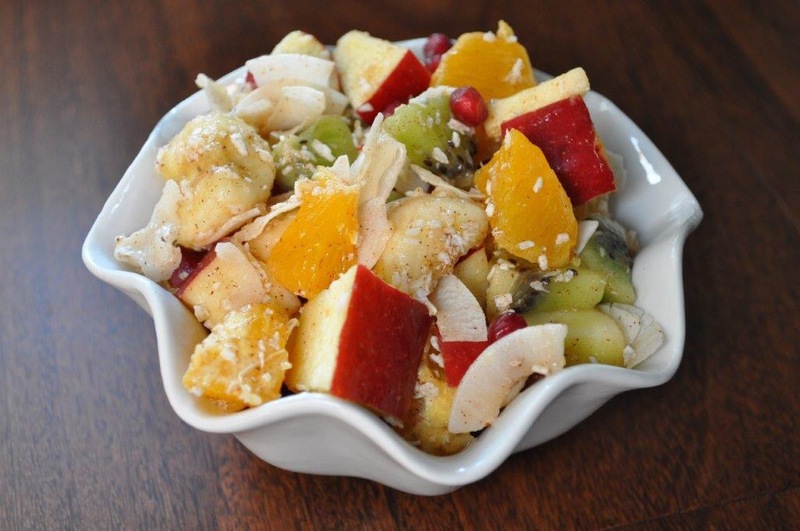 Side of fruit salad with cinnamon and flaked coconut. 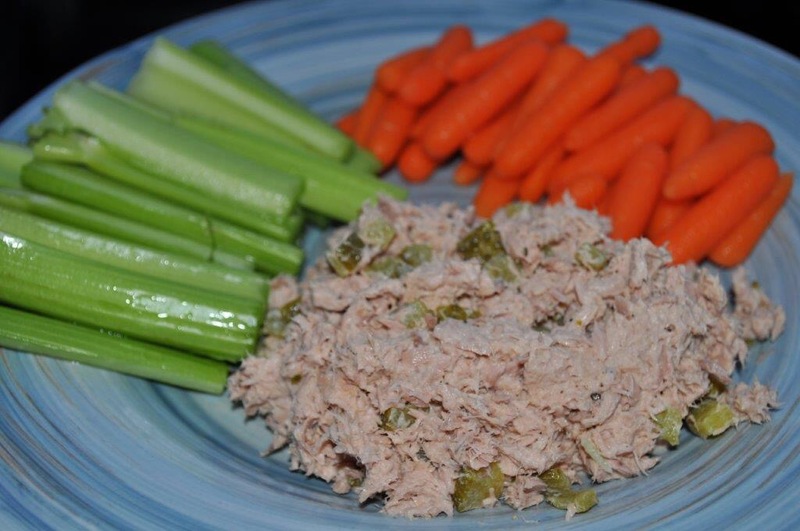 Meal 2 (Post workout): Tuna salad made with homemade mayo and pickles, carrots, celery and blood orange. 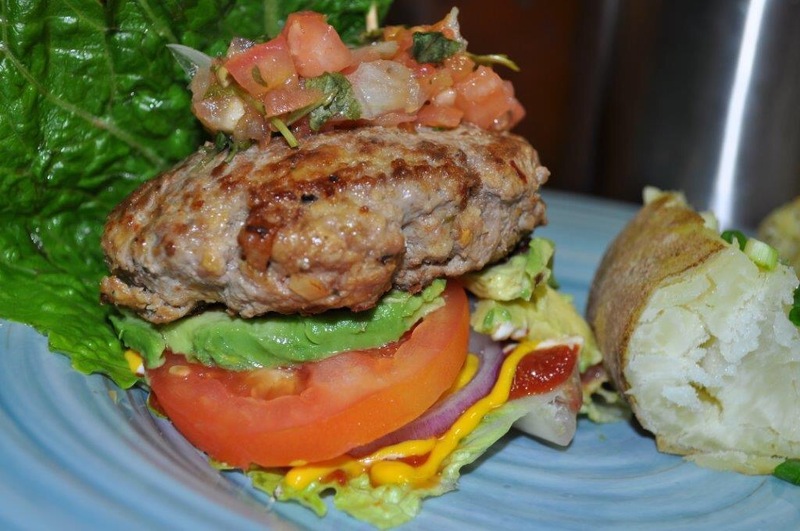 Meal 3: Turkey burger with homemade ketchup, mustard, avocado, tomato, onion, wrapped in lettuce. Side of homemade baked russet potato fries and homemade ketchup. 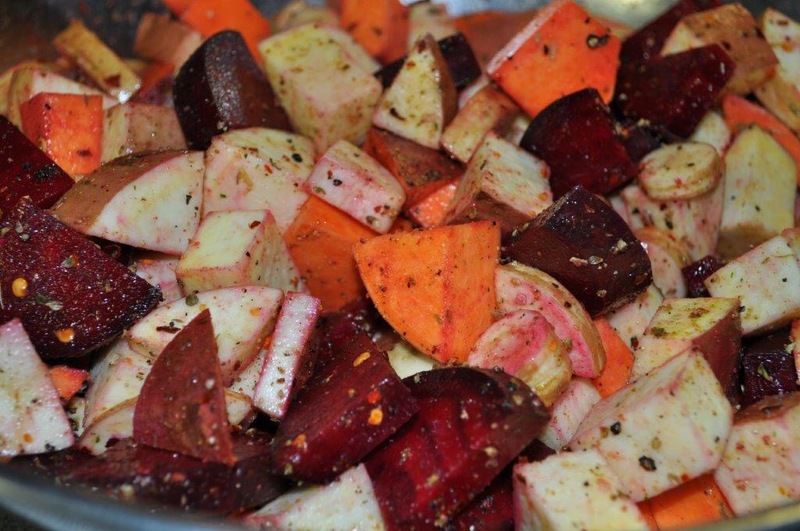 Meal prepping: I cut up 2 beets, 2 turnips, 1 yam, 1 large sweet potato, toss with extra virgin olive oil and herbs. 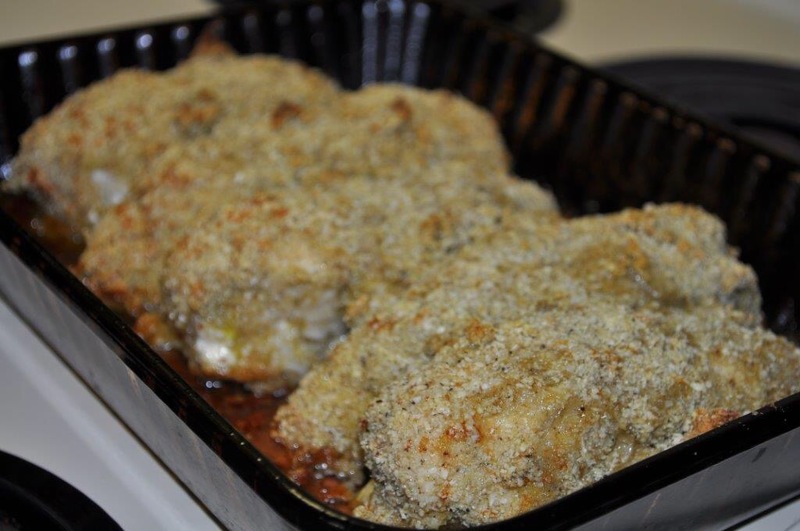 Baked chicken breast (hot sauce ones are for the boyfriend). 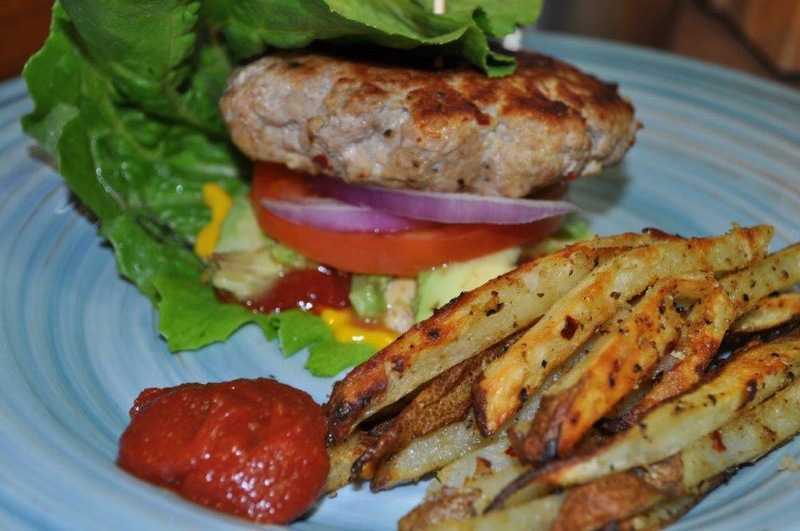 I also have leftover turkey burgers and salmon from yesterday. Always good to have a lot of protein cooked so I don’t mess up. Feeling good today just a little sore from my workout yesterday. 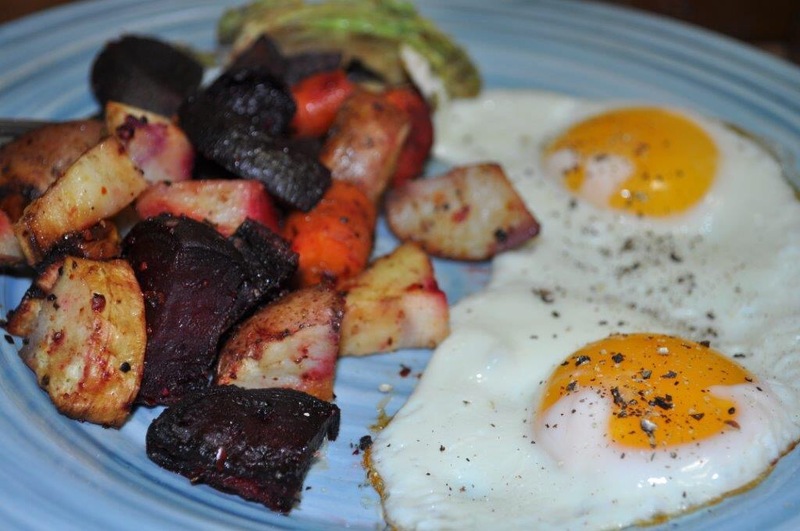 Meal 1: Root veggies, bacon, eggs and avocado. 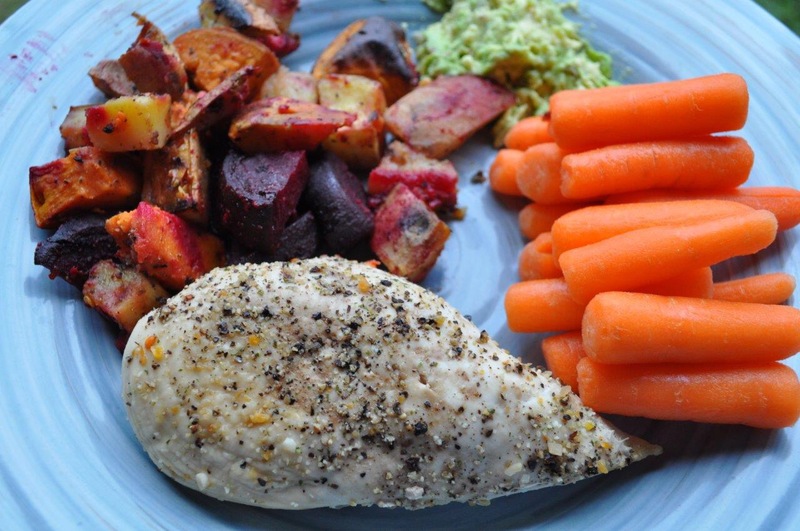 Meal 2: Chicken, root veggies, carrots and mashed avocado. 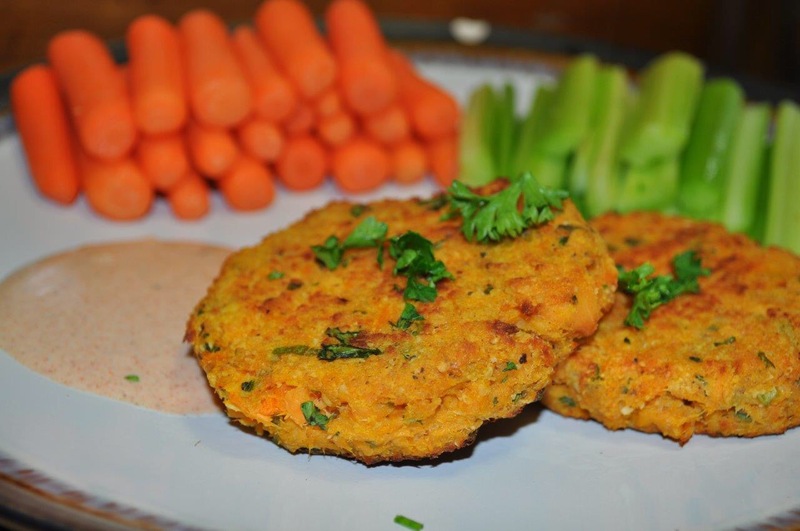 Meal 3: Salmon cakes with awesome sauce, carrots & celery. 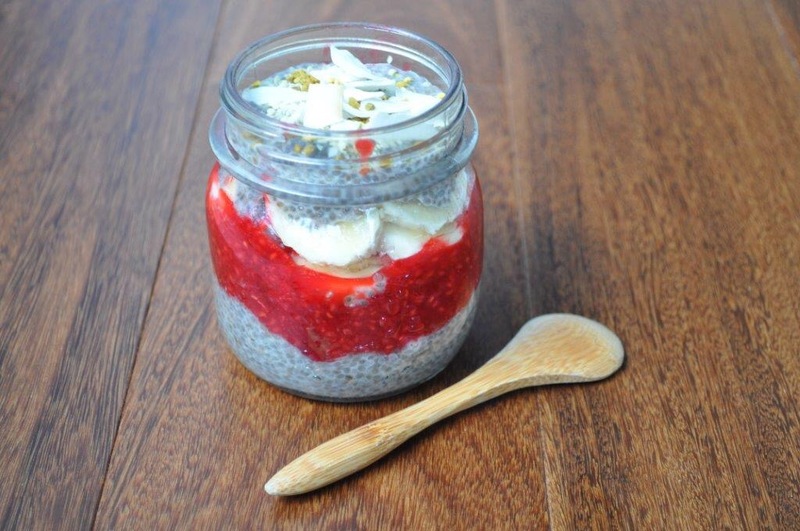 Breakfast is getting repetitive think I may have a chia pudding tomorrow for breakfast, soaking the seeds overnight. 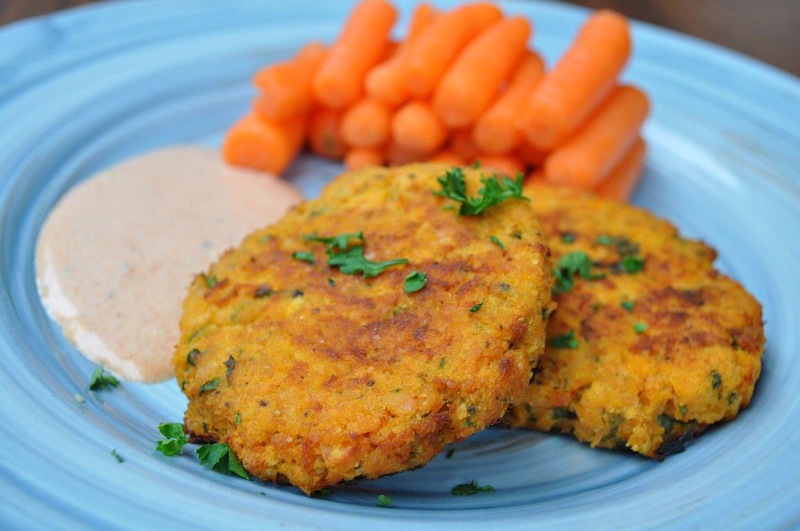 Meal 2: Leftover salmon cakes with awesome sauce and carrots. 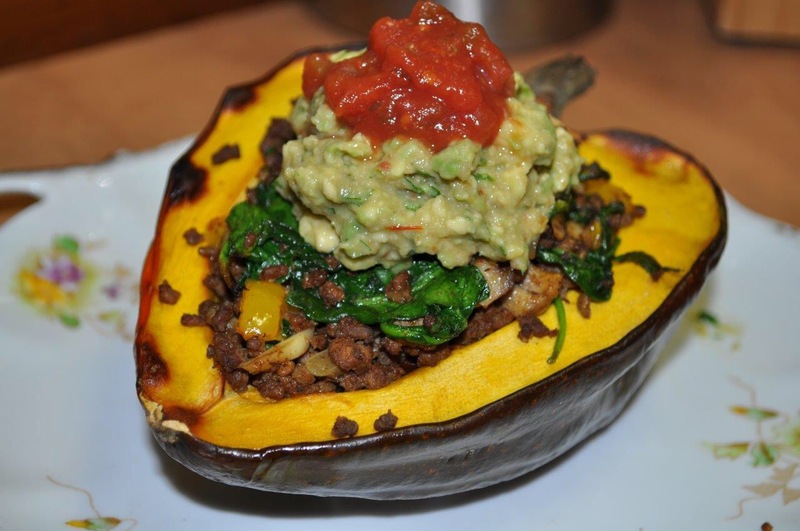 Meal 3: Stuffed acorn squash. Stuffing is ground bison sautéed with mushroom, onion, bell pepper, garlic and homemade taco seasoning. 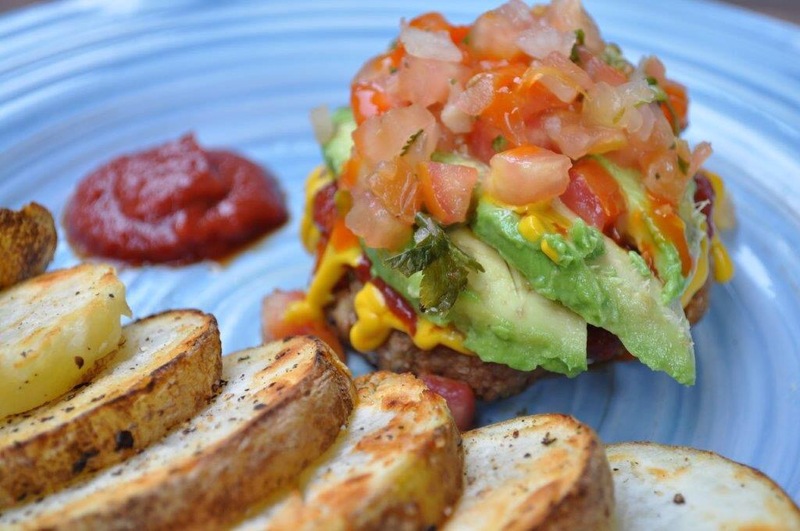 Topped with guacamole and salsa. 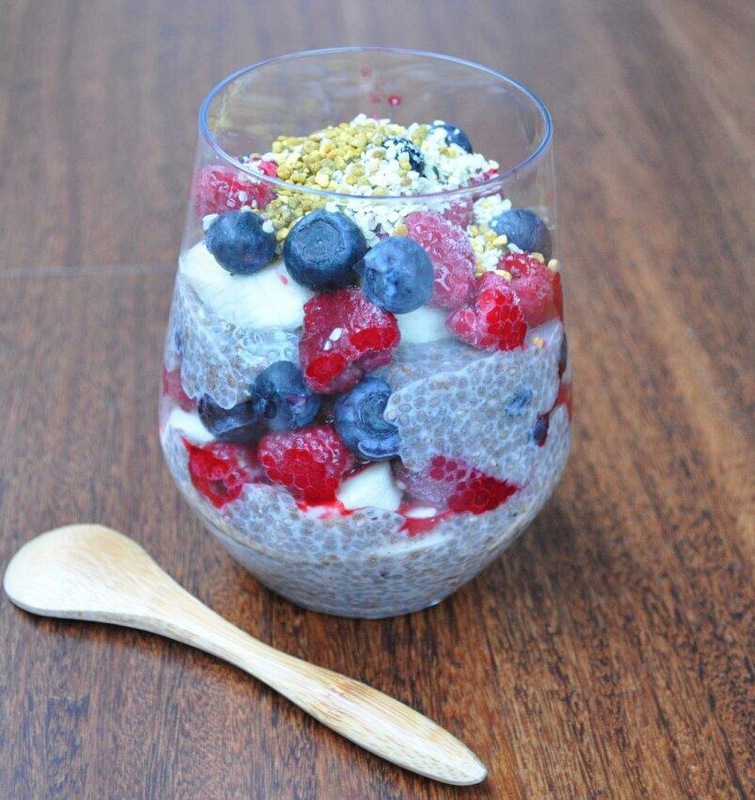 Meal 1: Chia parfait with banana, raspberries, blueberries, hemp hearts and bee pollen. 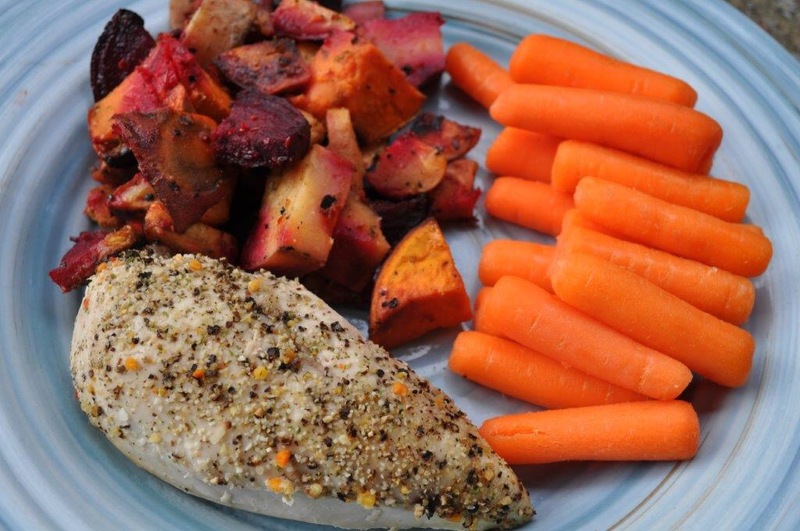 Meal 2: Chicken, root veggies, carrots and almond butter. 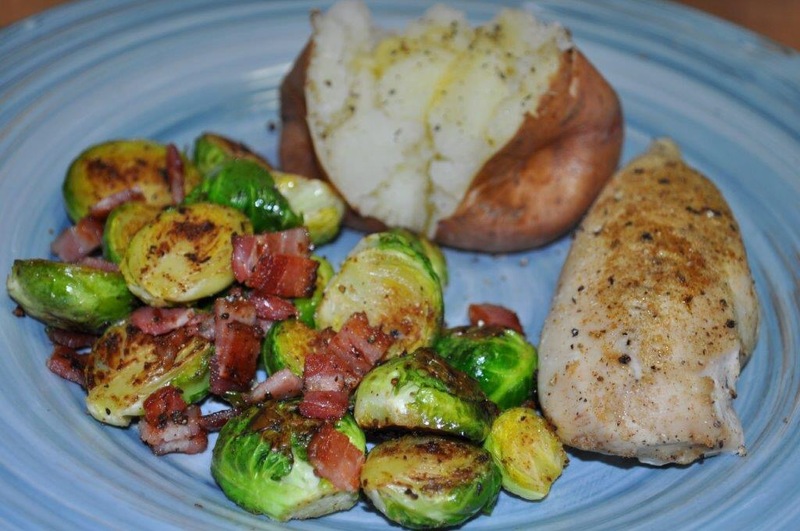 Meal 3: Lemon thyme chicken, red potato with ghee, Brussel sprouts with bacon. Two weeks in and I feel so great, I haven’t had a headache since day 3. Huge success for me as I get them often. I feel the tiger blood flowing! 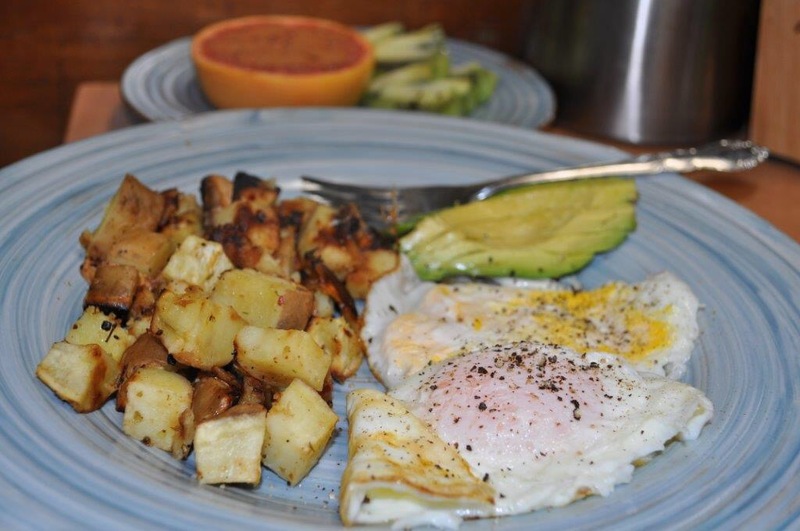 Meal 1: Root veggies, eggs, avocado, orange. 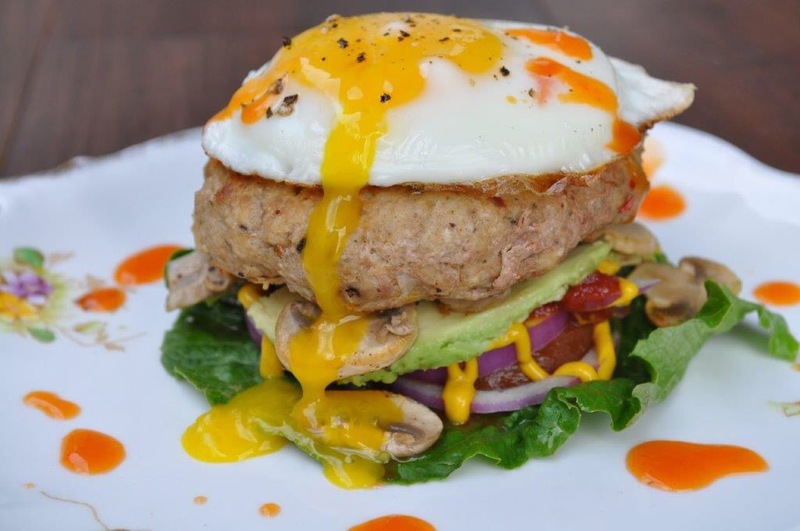 Meal 2: Leftover turkey burger with lettuce, fried mushrooms, mustard, homemade ketchup, red onion, avocado and topped with an egg. Two weeks down, two weeks to go! Meal 1: over easy eggs, leftover mash potatoes, avocado, grapes and blueberries. 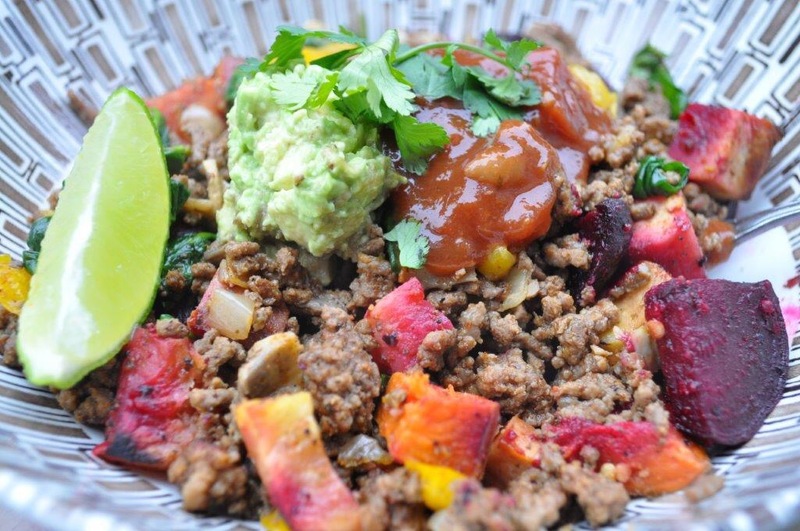 Meal 2: Root veggies topped with leftover ground bison, mashed avocado and salsa. Dinner: Went to a pot luck dinner, I brought veggies with homemade ranch, fruit tray and chicken wings with homemade BBQ. My sister also brought a Whole30 potato salad. I planned to not fail and succeeded! I also had some guacamole and olives that someone else brought. Officially at the halfway point! It was a leftover kinda day except for breakfast, ate most of the remaining food in my fridge. 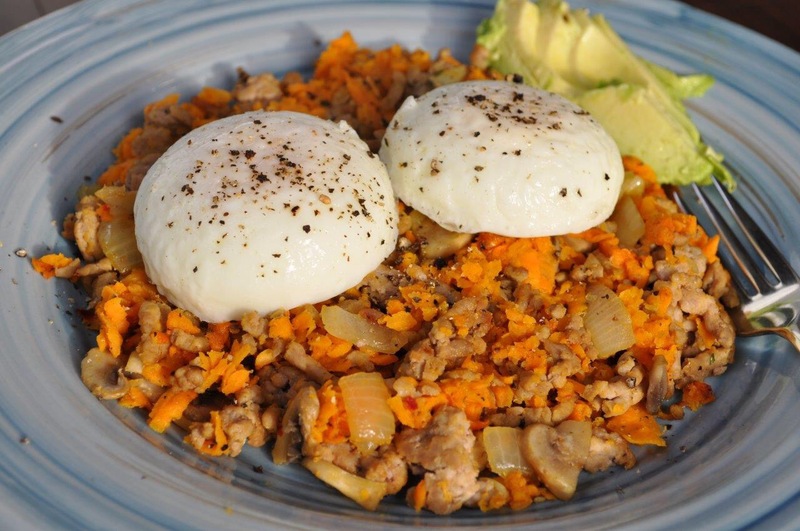 Meal 1: Sweet potato hash, 2 poached eggs, avocado. Meal 2: Chicken, small piece of salmon, root veggies, leftover veggies and dip. 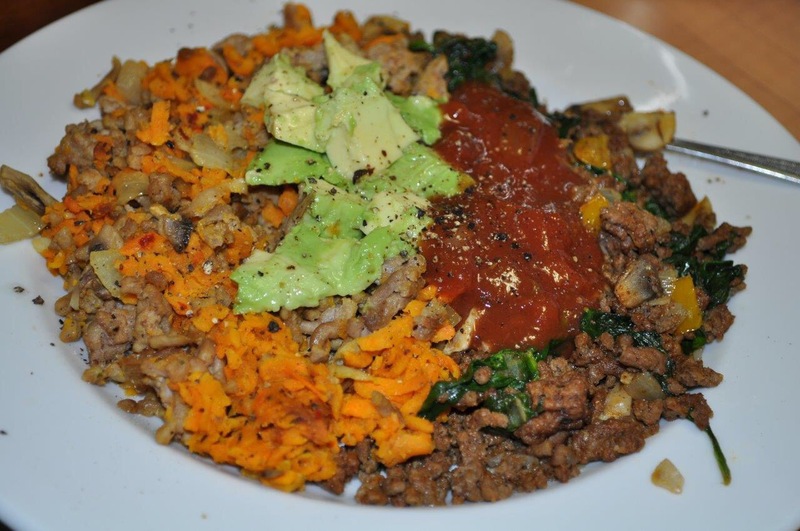 Meal 3: Leftover sweet potato hash and ground bison with salsa and avocado. Had a nice sleep In today. Feel great still! 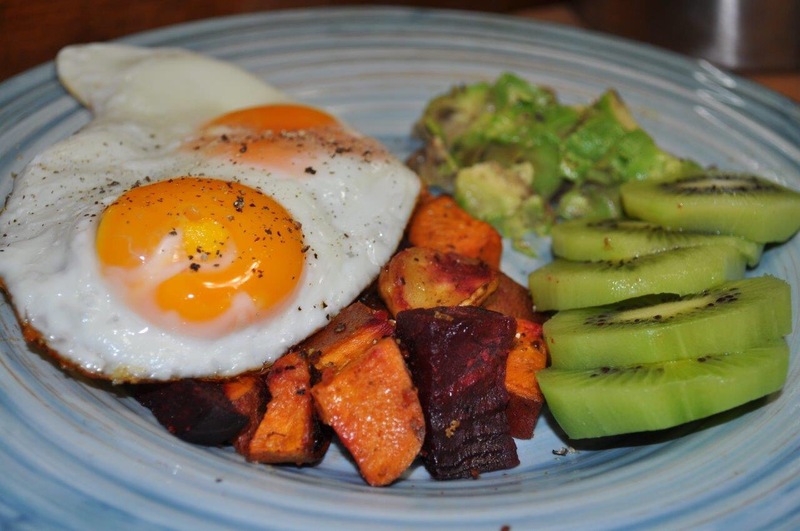 Meal 1: Baked sweet potato, 3 eggs, avocado. 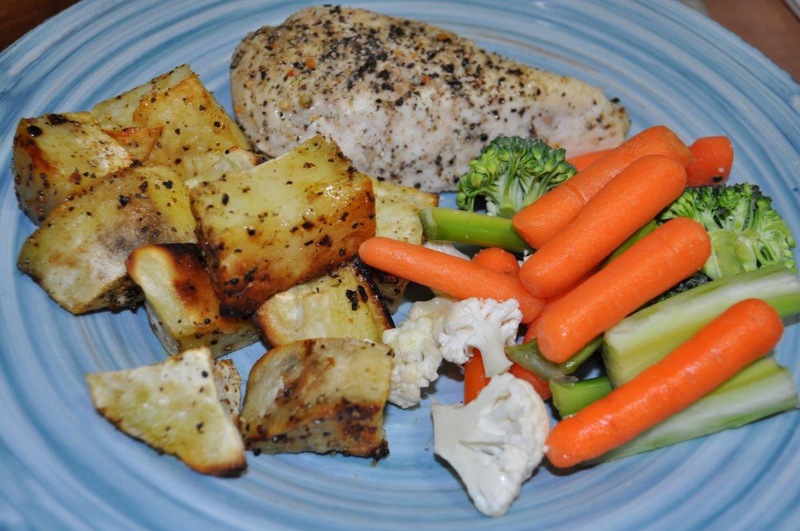 Meal 2: Chicken breast, baked sweet potato, raw veggies. Meal 3: Coconut crusted chicken strips with homemade bbq, broccoli and cauliflower. 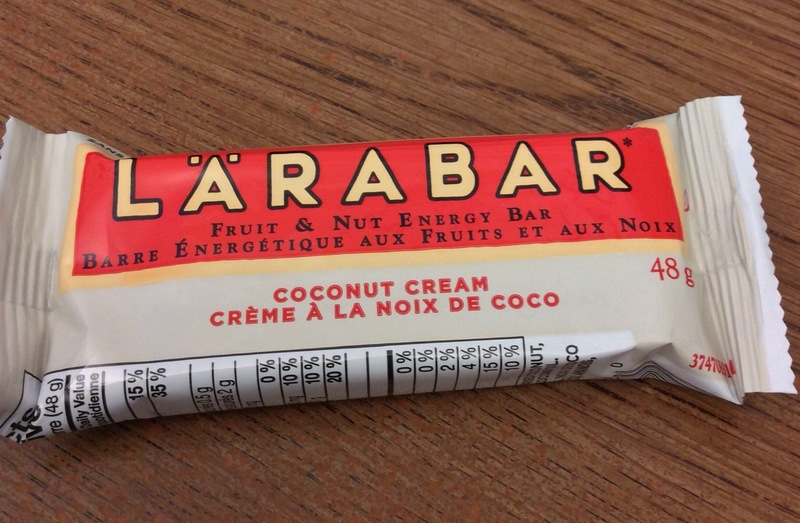 I had coconut water pre and post workout as well. 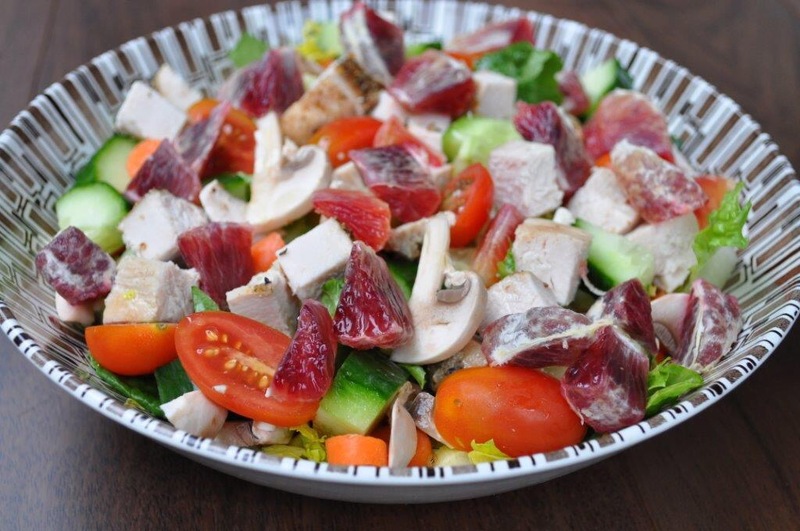 Meal 2: Green salad with chicken and blood orange. 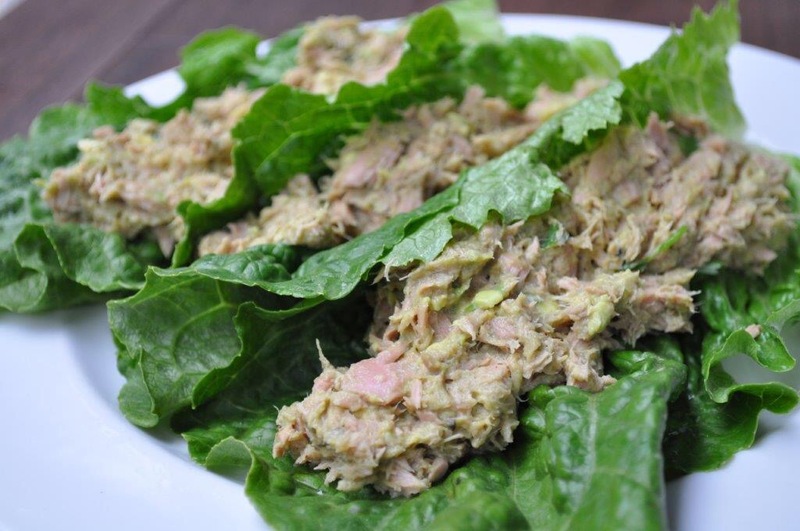 Tossed with avocado oil and Apple cider vinegar. 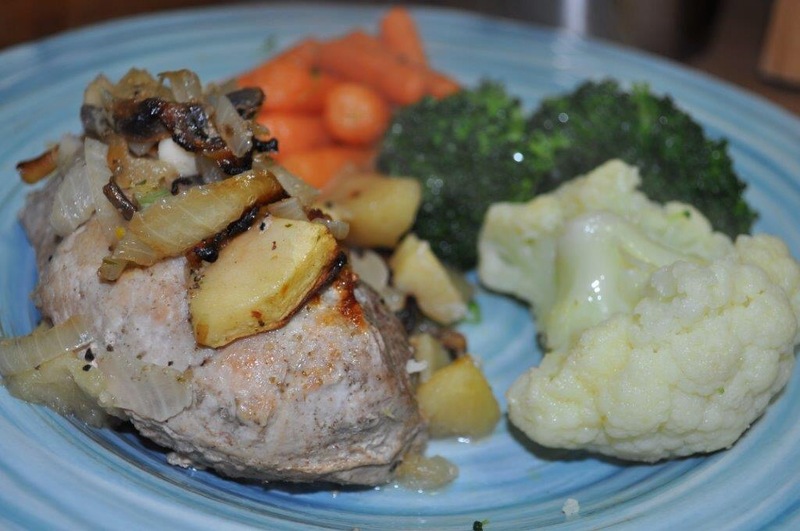 Meal 3: Pork sirloin with apples, mushroom onion, garlic. 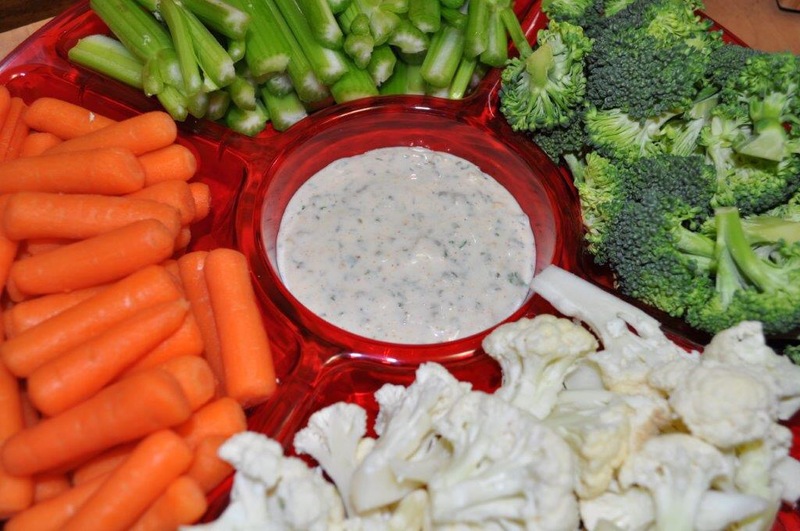 Carrots, broccoli, cauliflower with ghee. Meal 1: Eggs, root veggies, avocado, kiwi. 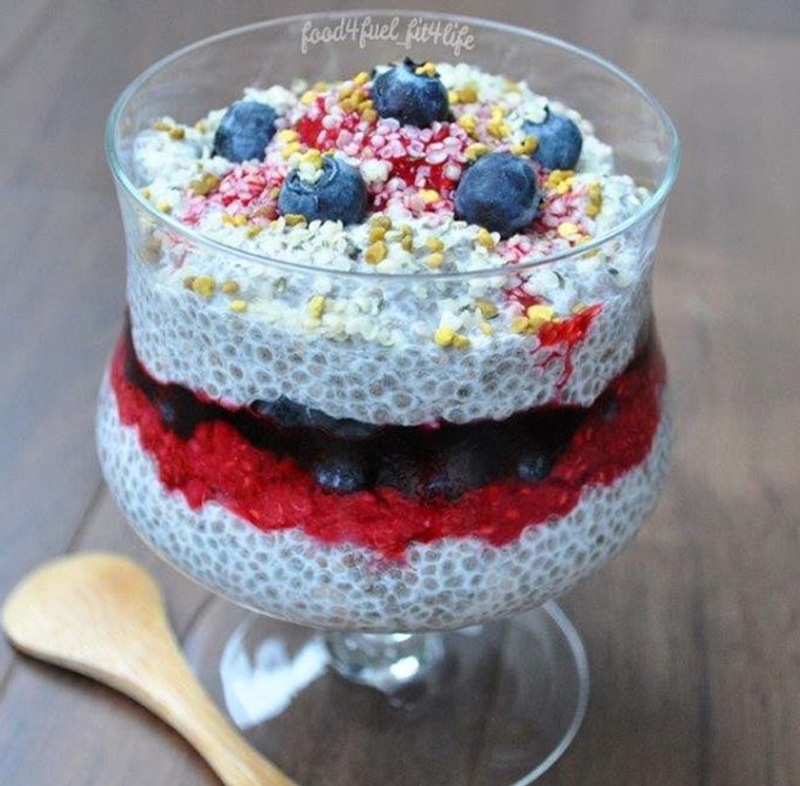 Meal 1: Chia pudding layered with mashed raspberries and blueberries, topped with hemp hearts and bee pollen. Yum so delicious! Only 9 days left!! 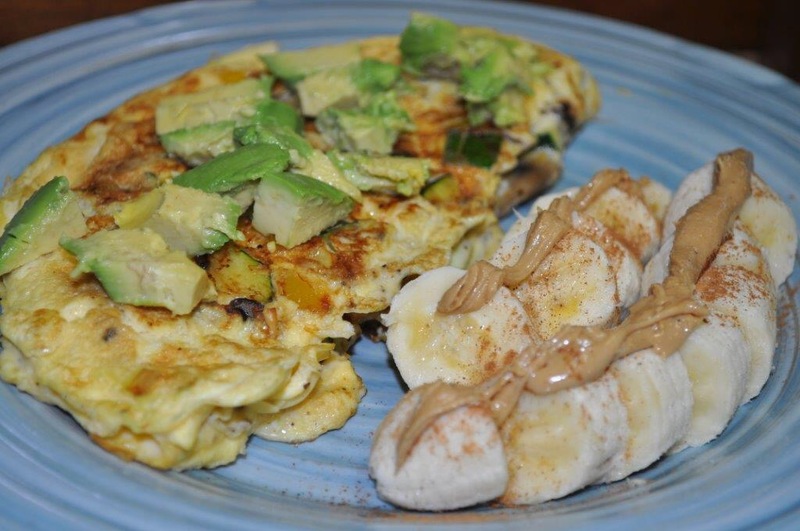 Meal 1: Mushroom, zucchini, onion omelet. Avocado. 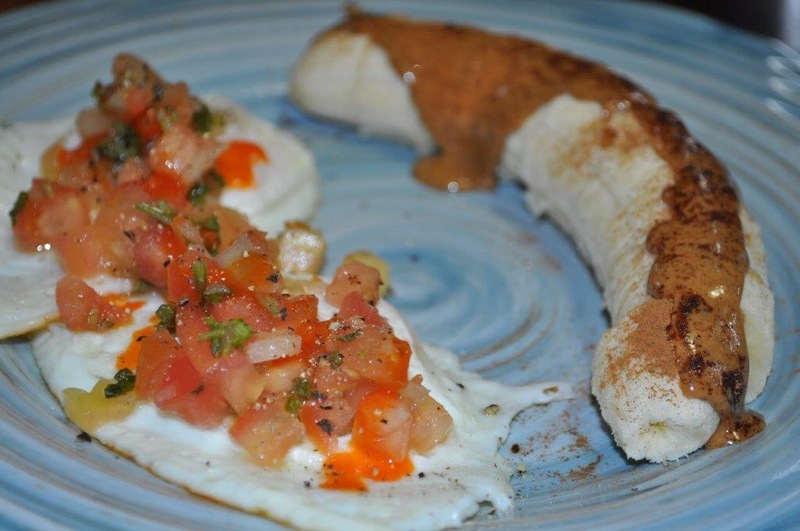 Banana with cinnamon & cashew butter. 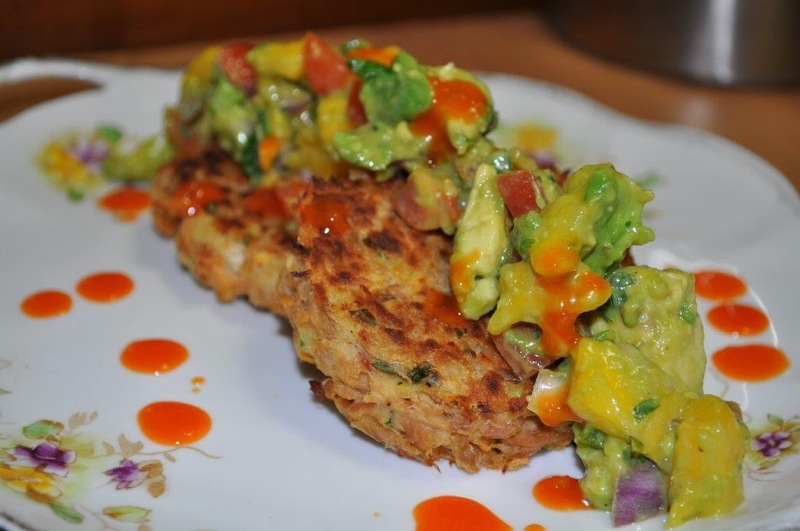 Meal 2: Leftover Spicy tuna/salmon cakes with mango avocado salsa. Meal 3: Store bought roasted chicken, green salad with homemade Italian dressing. Orange. 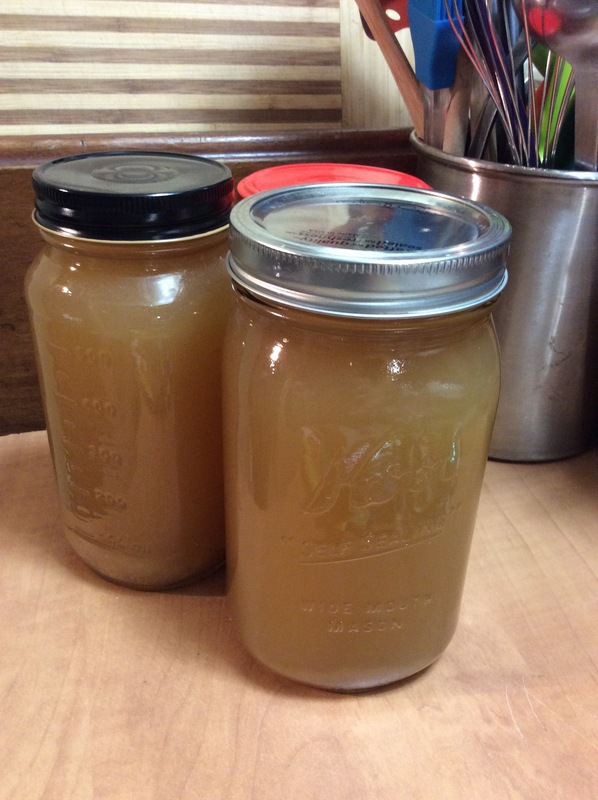 Been making bone broth from the chicken carcass overnight, simmered for 14 hours. 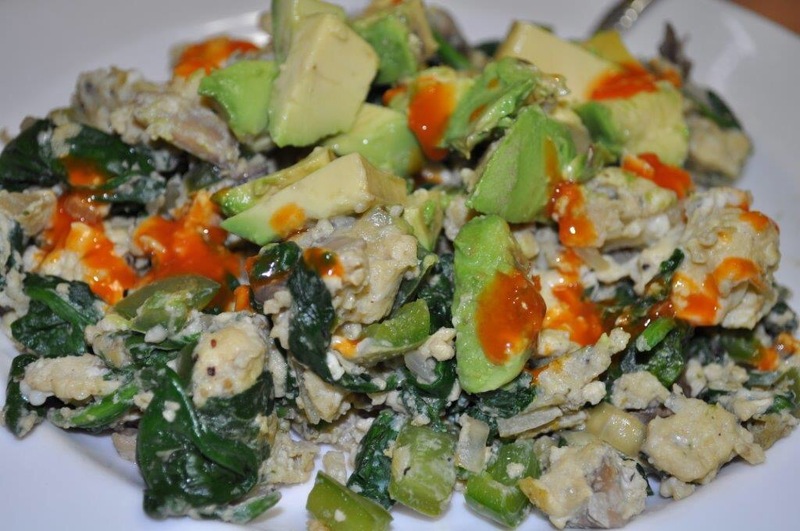 Meal 1: Scrambled eggs, mushroom, onion, spinach, avocado. 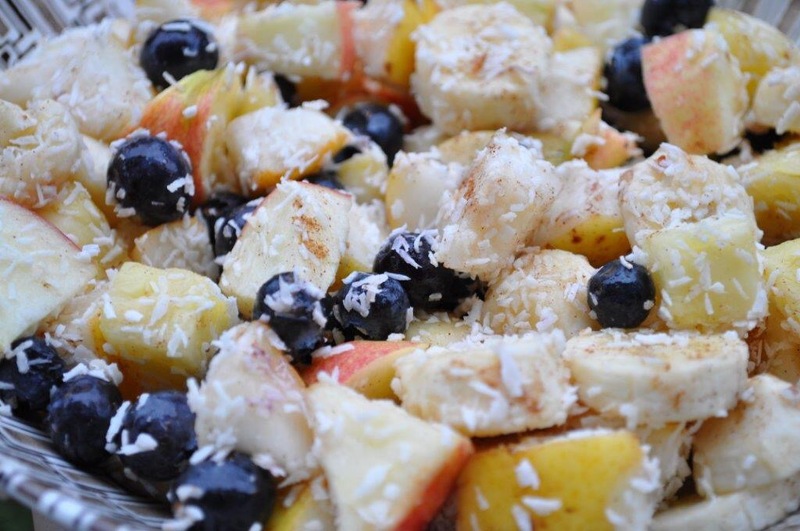 Fruit salad. 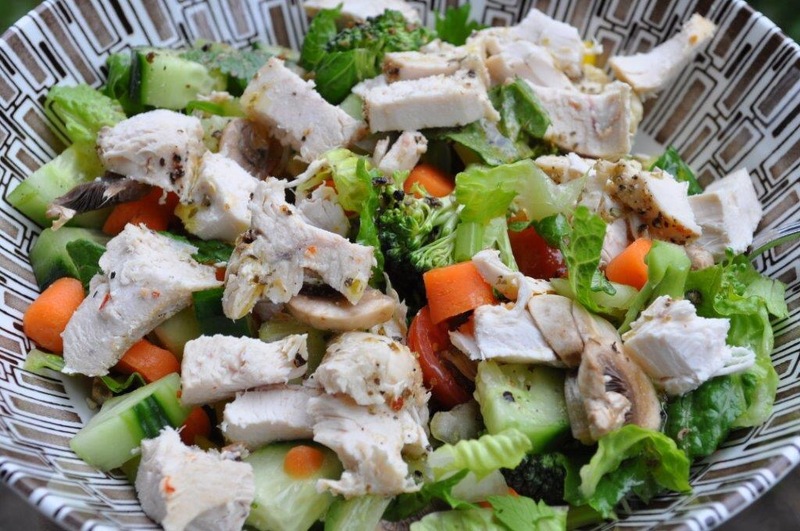 Meal 2: Green salad with chicken and Italian dressing. 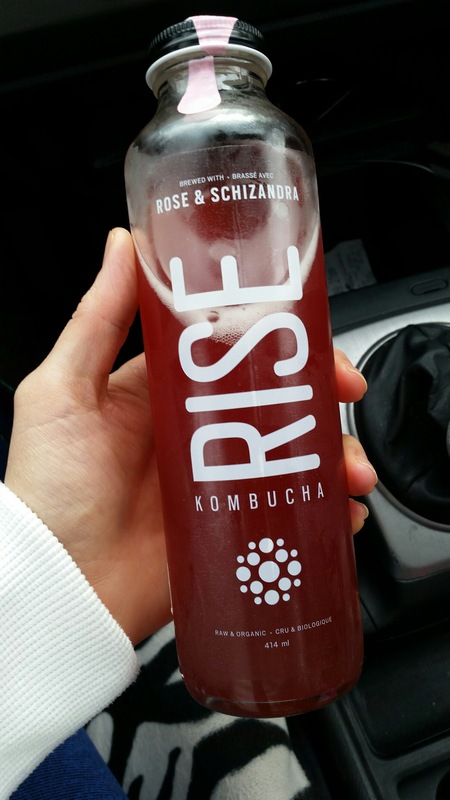 Snack: Rise Kombucha “Rose & Schizandra”. 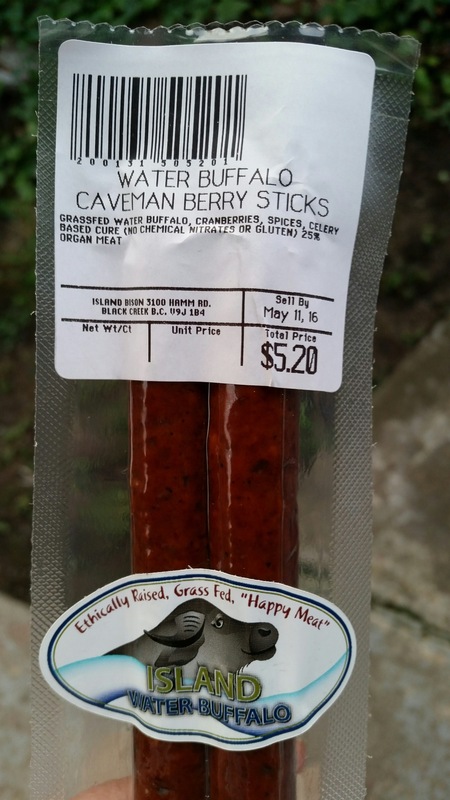 Water buffalo caveman berry pepperoni. 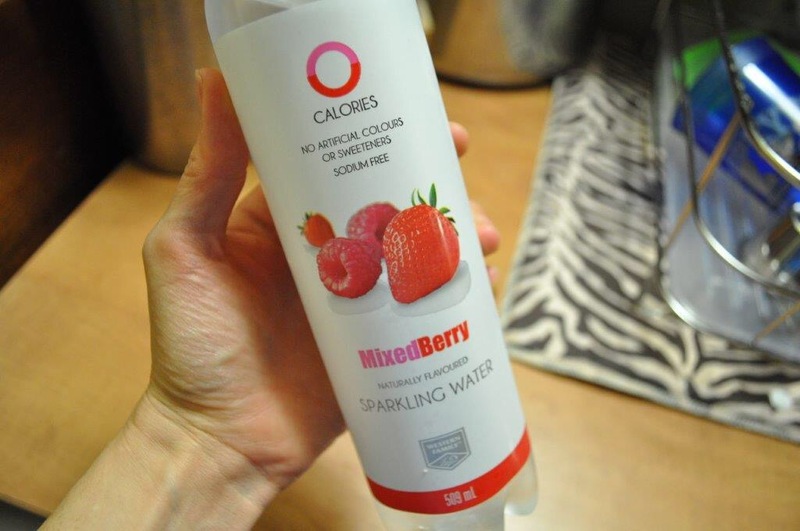 Went to the health show today and found these yummy gems! 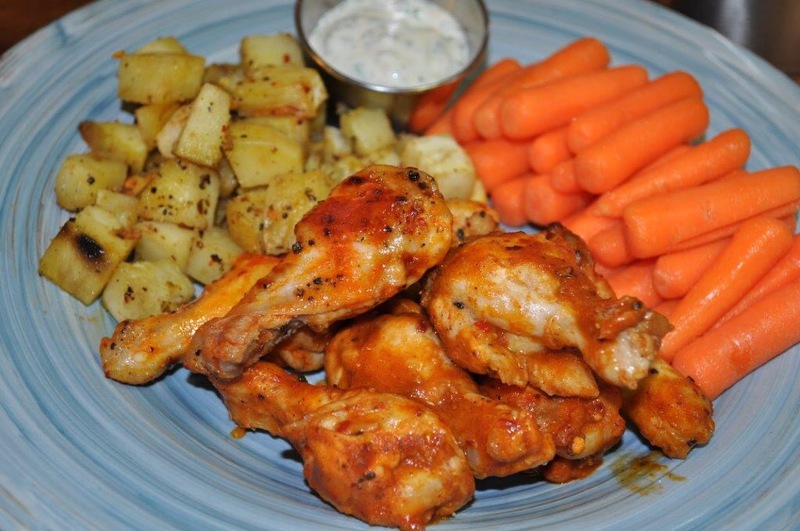 Meal 3: 1/2 BBQ & 1/2 Frank’s Hot wings, carrots with homemade ranch, sweet potato home fries. 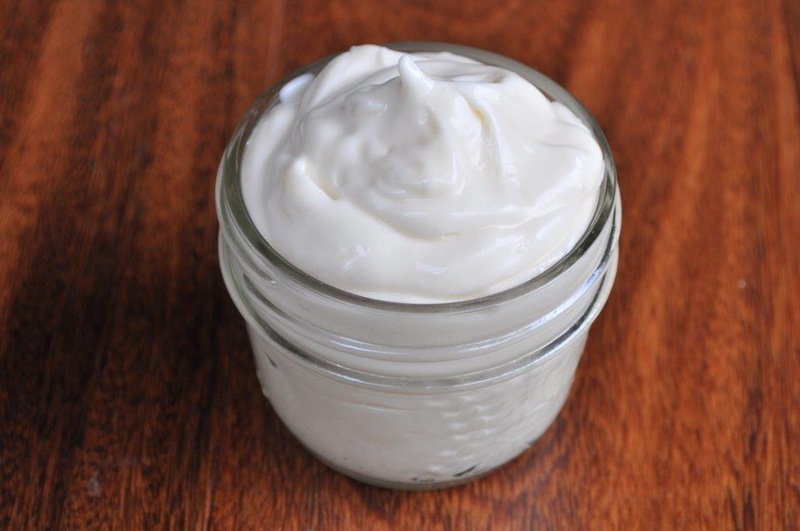 Made a batch of mayo today and then some ranch. Here’s my bone broth. 3 big jars! 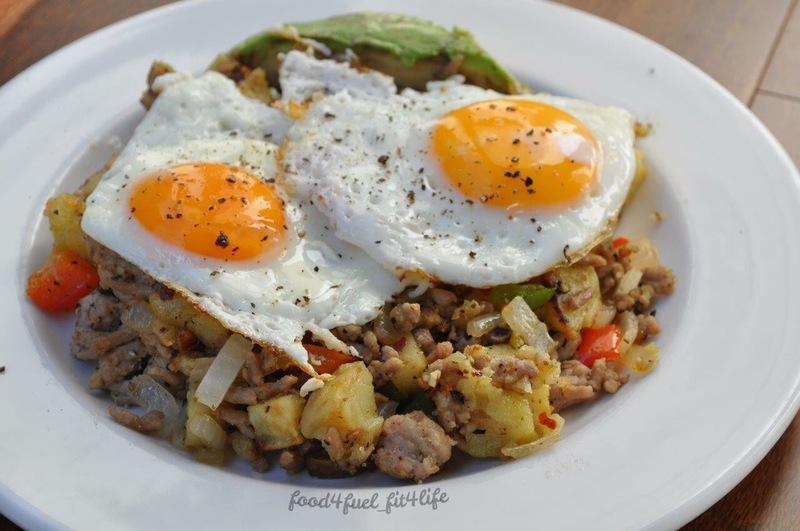 Meal 1: Kitchen sink hash. 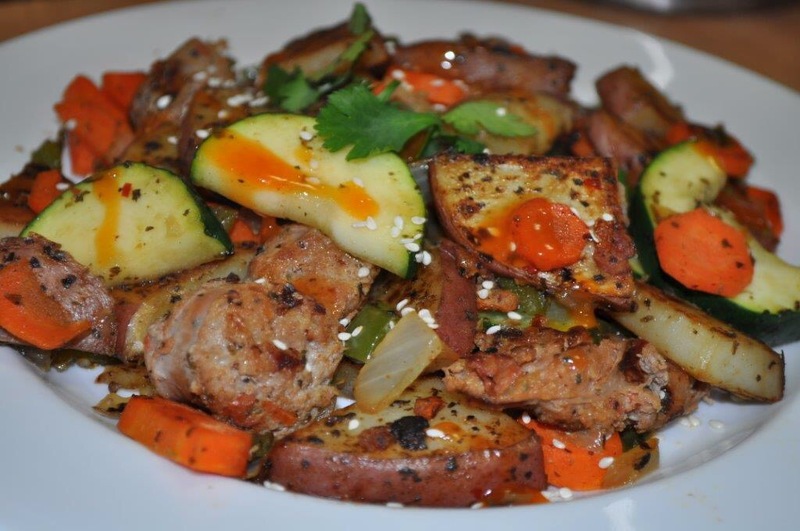 Leftover pork sirloin, leftover sweet potato home fries, mushroom, onion, Apple, garlic all sautéed in a pan. 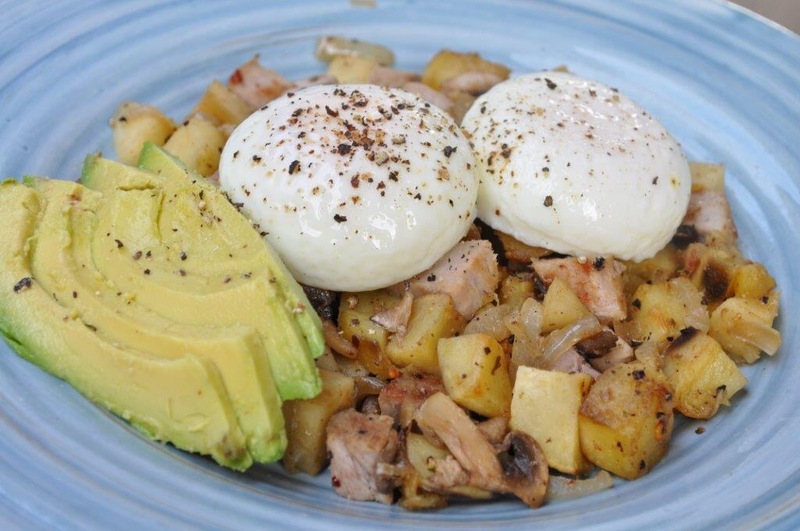 Topped with two poached eggs and side of avocado. Kombucha. 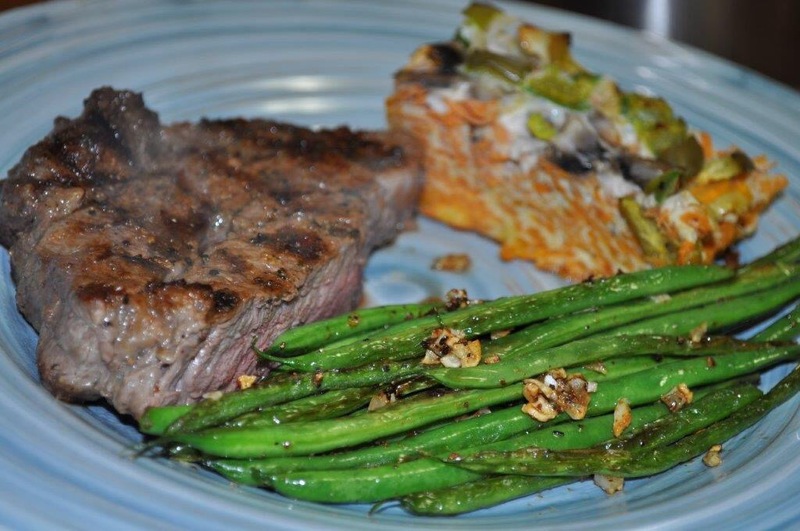 “Kitchen sink” refers to leftovers thrown all together and that is what I did with this dish. Post workout: Bone broth, date roll. 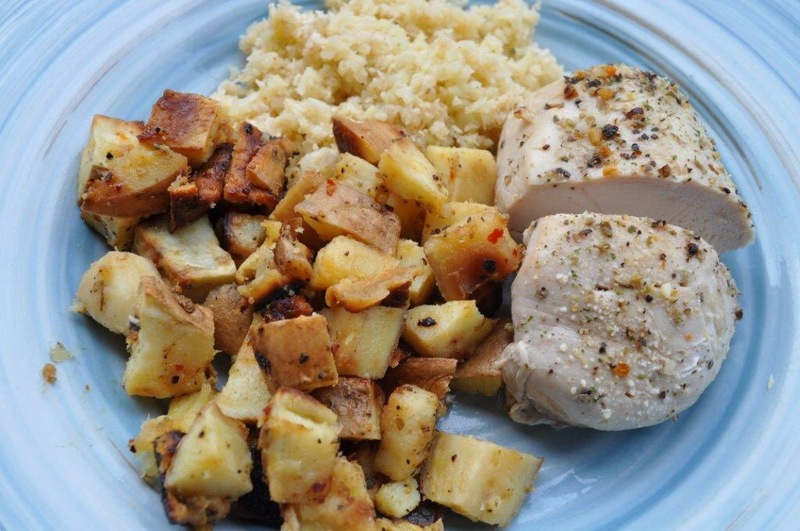 Meal 3: Chicken breast, green cauliflower with ghee, sweet potato home fries. Did my normal meal prep today, baked chicken and sweet potato home fries for the week. Here we go final week! 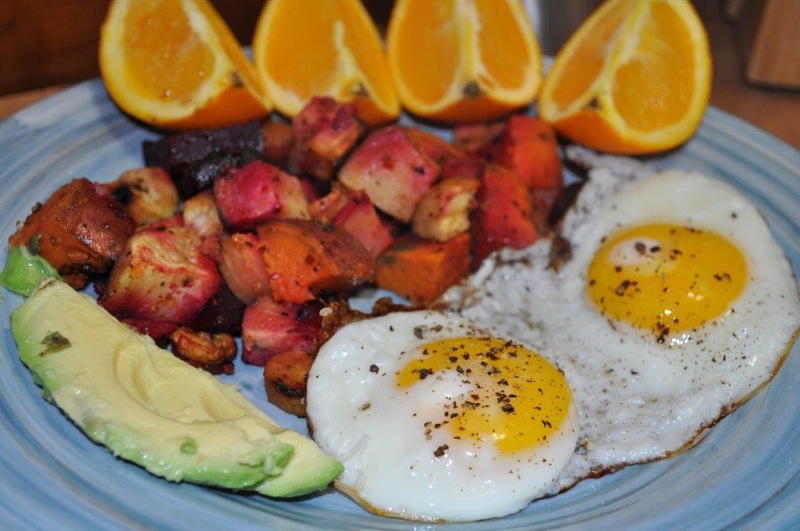 Meal 1: Eggs, sweet potato home fries, avocado, half grapefruit with cinnamon and kiwi. 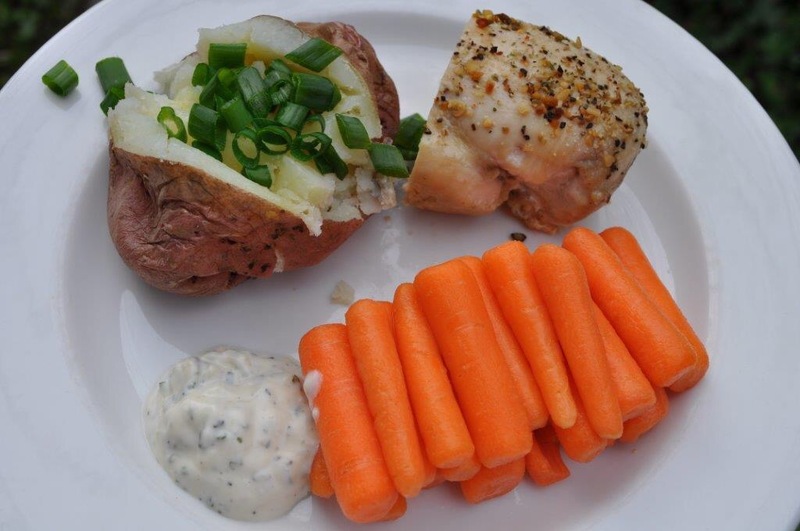 Meal 2: Chicken breast, red potato, carrots and homemade ranch. Meal 3: Mexican burrito bowl. 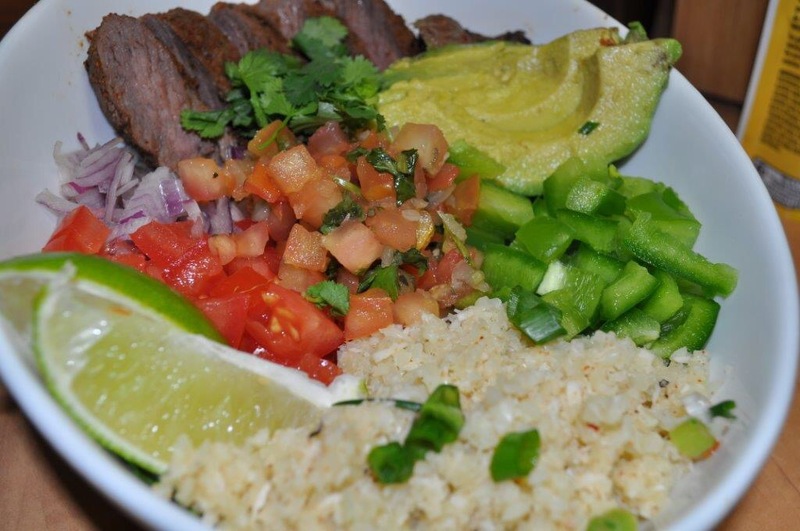 Lettuce, taco cauli rice, green onion, bell pepper, avocado, salsa, tomato, red onion, taco seasoned top sirloin, cilantro and fresh squeezed lime. 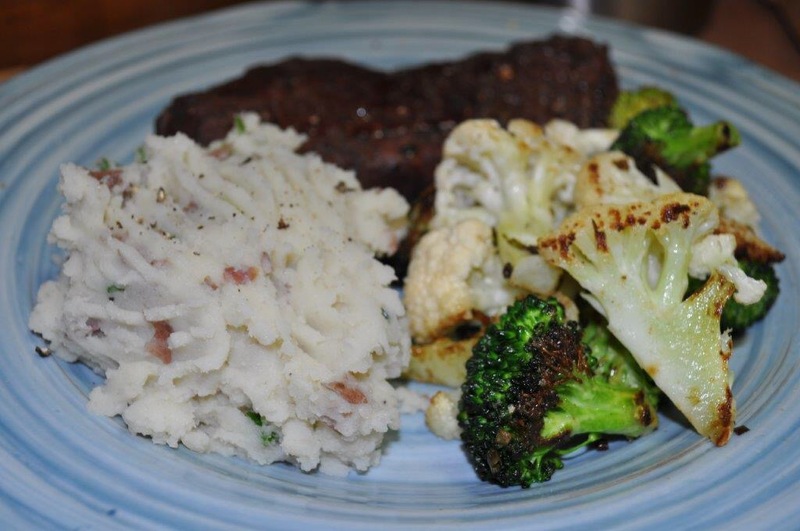 My last meal was absolutely delicious, definitely repeating!! 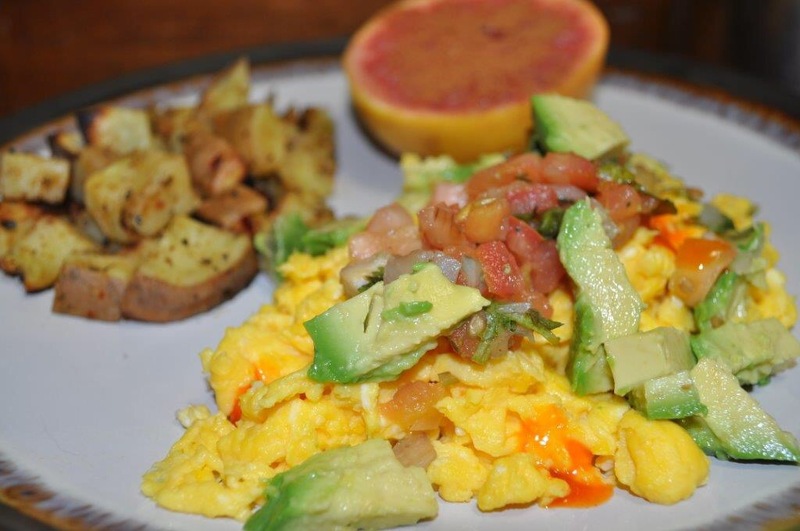 Meal 1: Scrambled eggs topped with salsa and avocado, side of sweet potato home fries and 1/2 grapefruit with cinnamon. Meal 2: Chicken breast, sweet potato hom fries, leftover cauli rice. Meal 3: Pork and beef burger with ketchup, mayo,mustard, tomato, red onion, avocado, salsa, wrapped in lettuce bun. Side of 1/2 russet potato with ghee and green onion. 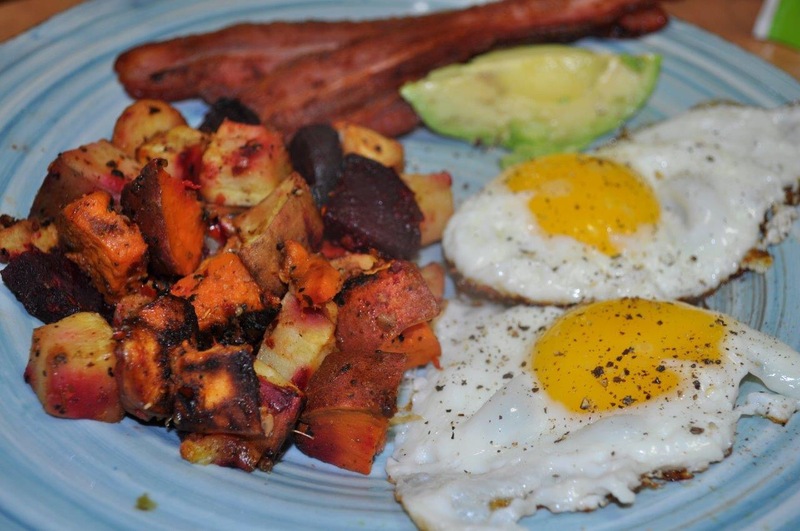 Meal 1: Over easy eggs, sweet potato home fries, avocado. 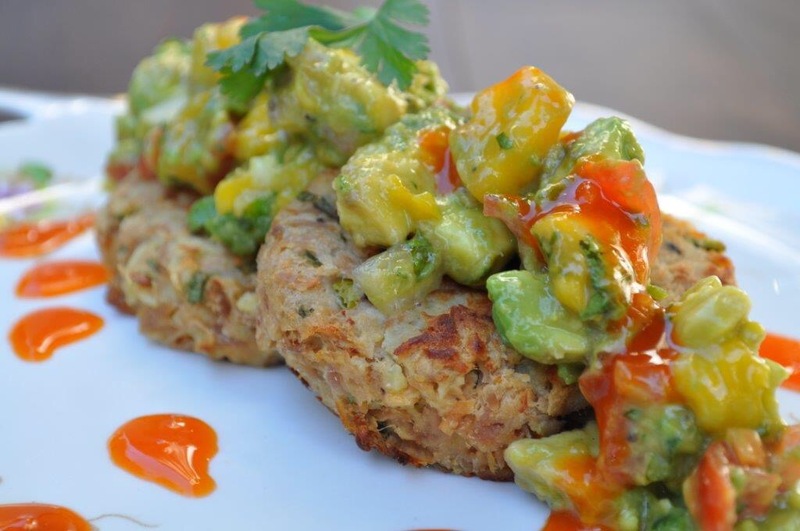 Meal 2: Leftover turkey burger topped with ketchup, mustard, avocado & salsa. 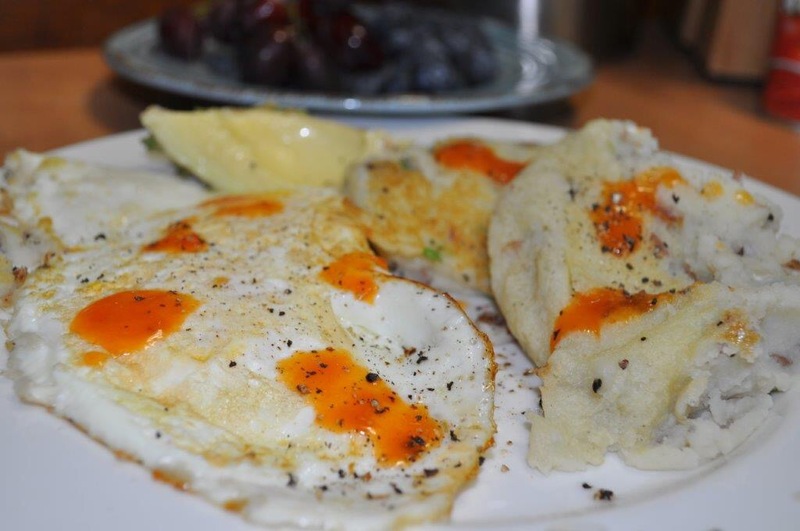 Side of russet potato discs and ketchup. 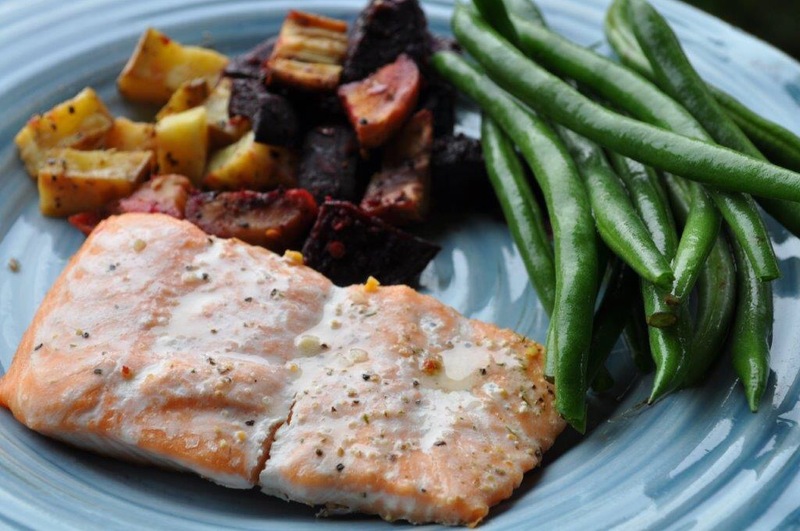 Meal 3: Salmon, green beans and red potato with hot sauce. Meal 1: Over easy eggs with salsa and hot sauce. Banana with almond butter and cinnamon. 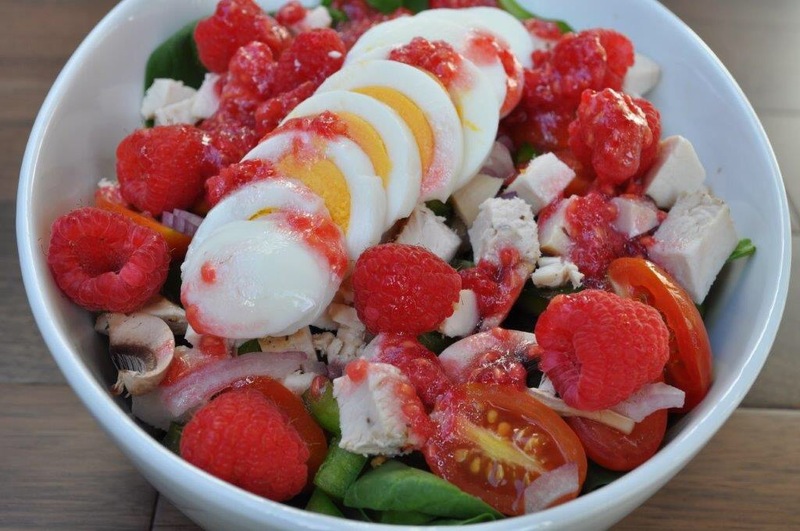 Meal 2: Raspberry spinach salad – Spinach, mushroom, cherry tomato, bell pepper, red onion, chicken breast, raspberries and hard boiled egg. 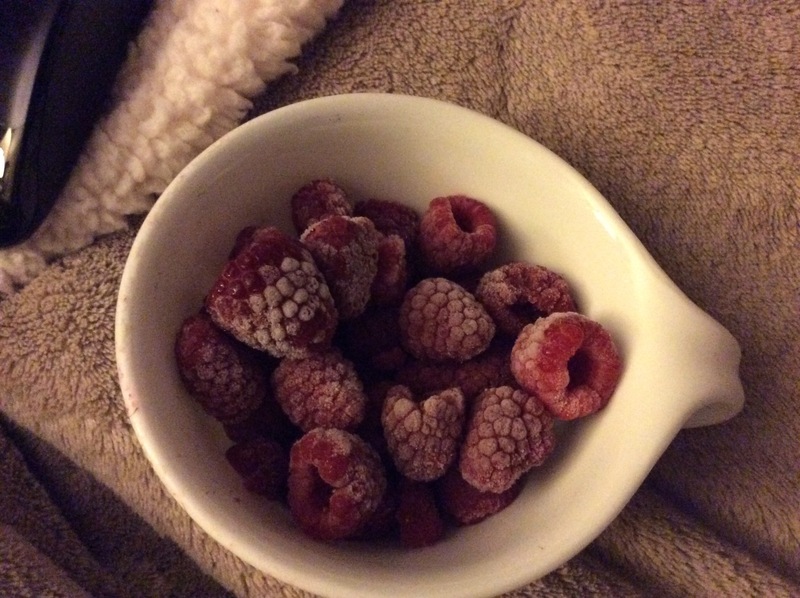 Tossed with raspberry vinaigrette (mashed raspberry, Apple cider vinegar, avocado oil). 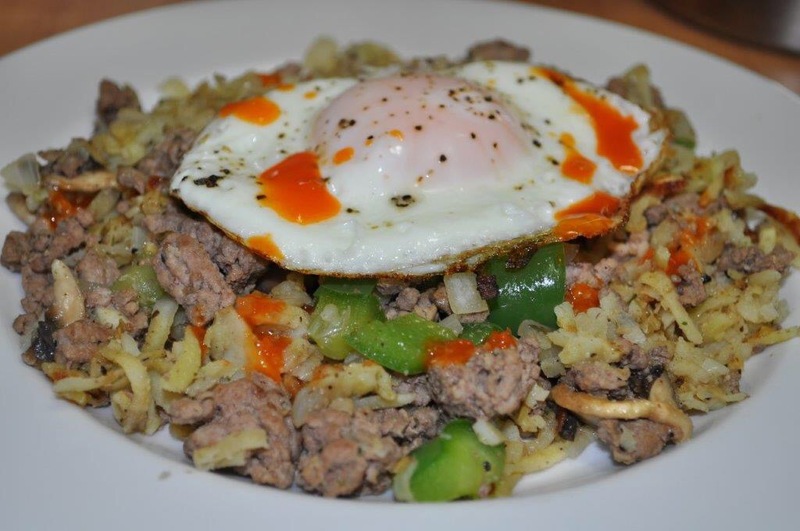 Meal 3: Sweet potato hash with ground pork/beef, mushroom, onion, bell pepper, garlic and shredded sweet potato, topped with fried egg and hot sauce. 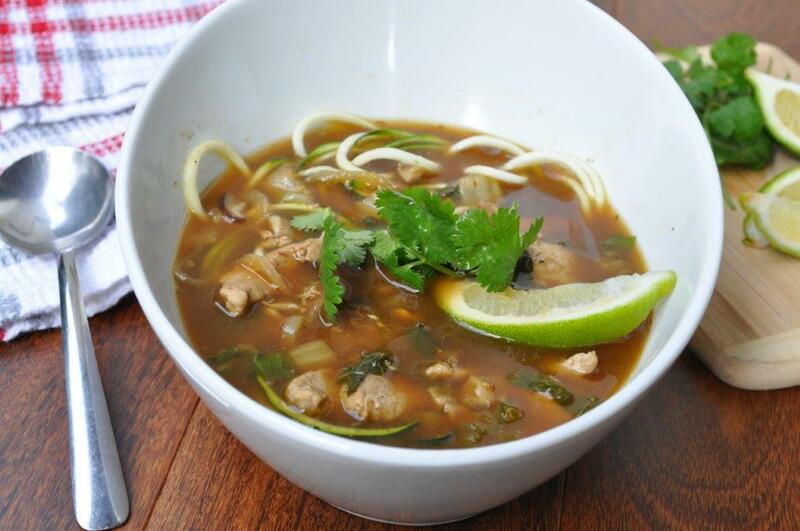 Can’t believe there are only 2 days left … 6 meals to go! 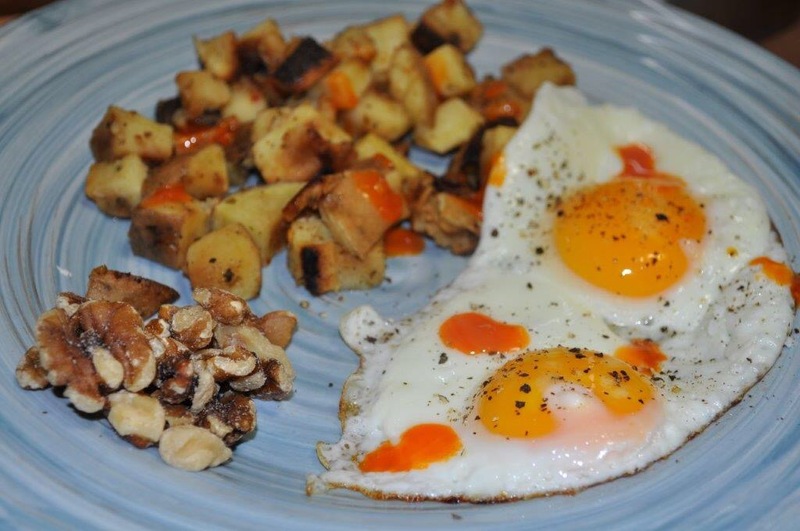 Meal 1: Eggs, sweet potato home fries, walnuts. Meal 2: Leftover sweet potato hash, kiwi. Pre workout: Hard boiled egg, Tbsp. Cashew butter. Yay I made it! What an amazing feeling, I feel so energized, clear headed and strong! 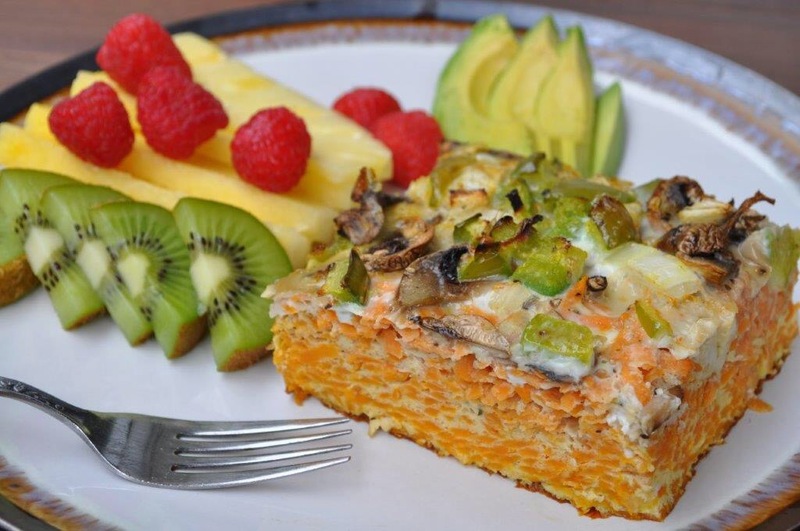 Meal 1: Yam Frittata with kiwi, pineapple, raspberries and avocado. 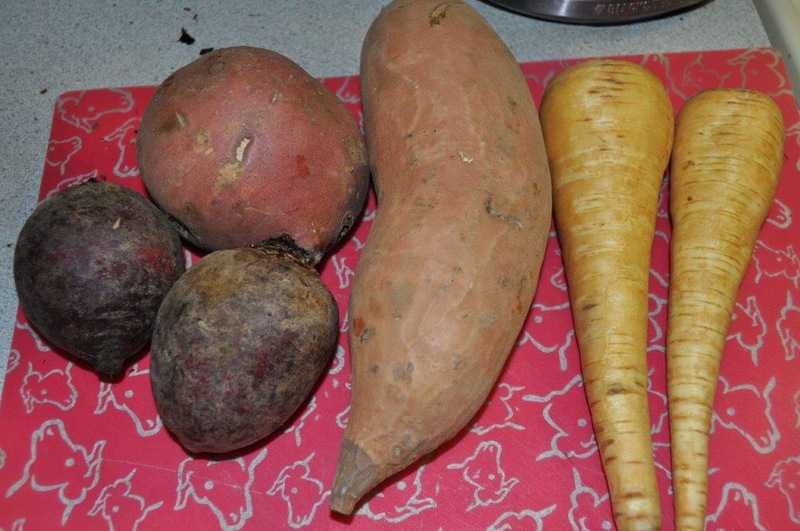 Preheat oven to 375º C. Peel and shred yams or sweet potatoes (I used shred blade on my food processor). Grease baking dish with coconut oil (I used glass 9×6). 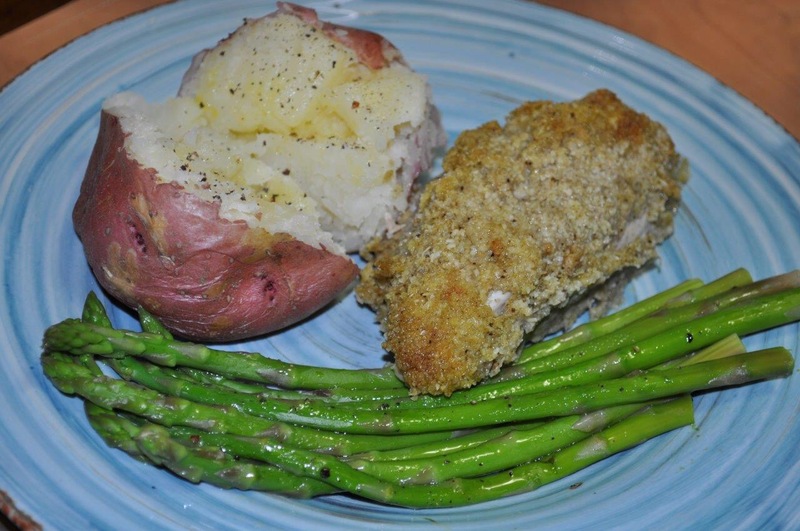 Press shredded potatoes into greased baking dish. 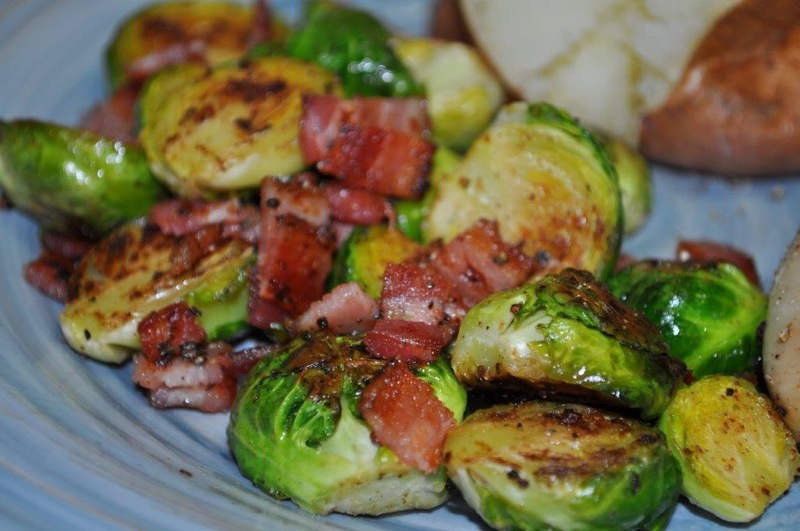 Cut up all your veggies (change up veggies if you like), spread veggies over potatoes evenly and top with chopped bacon. Whisk eggs and season with s&p and any other spices desired, pour over potatoes and veggies evenly. Bake for 40-50 minutes. Rest 5 minutes. Slice and serve! Meal 3: Steak, green beans with garlic and coconut oil, leftover frittata, side romaine with homemade dressing. That’s it finished my third Whole30. 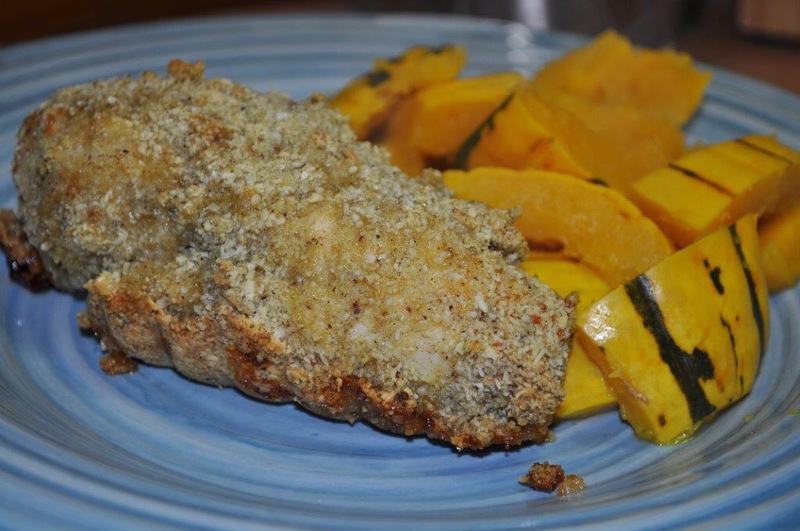 If I have not listed a recipe you would like please comment and I can share with you. Thanks for following! 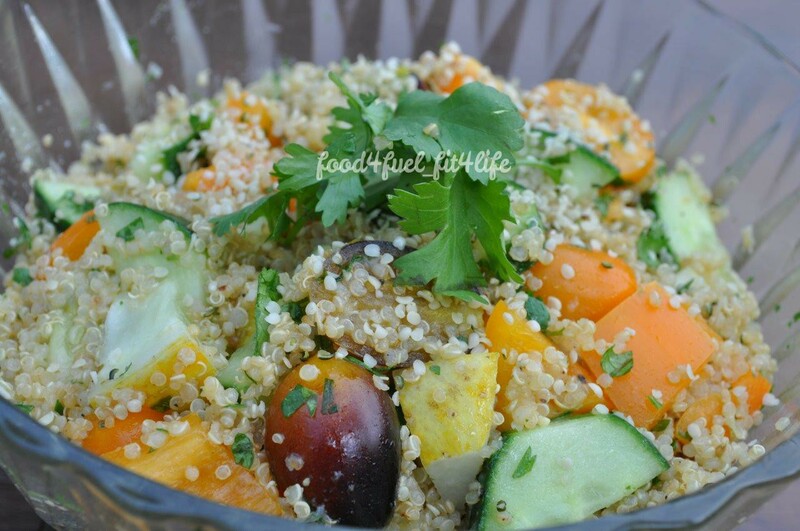 I used a lemon cucumber, indigo fire cherry tomatoes and cilantro in this salad from my garden. 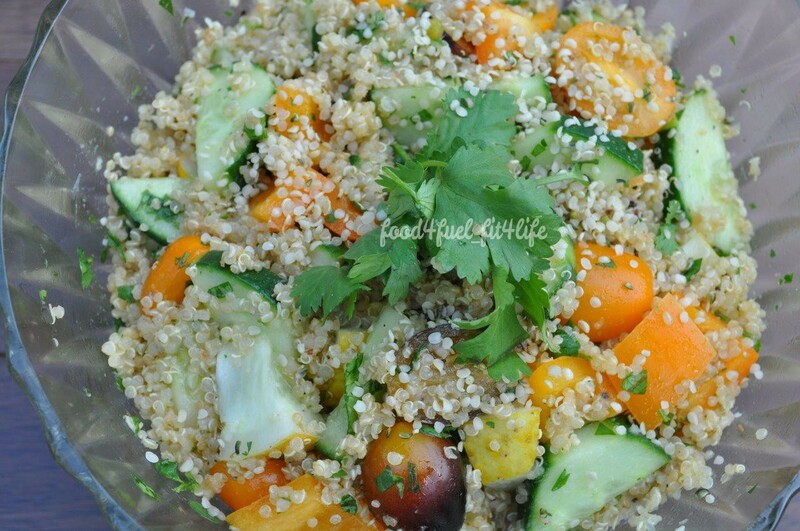 This is by far my favorite salad I could eat it every day for lunch! 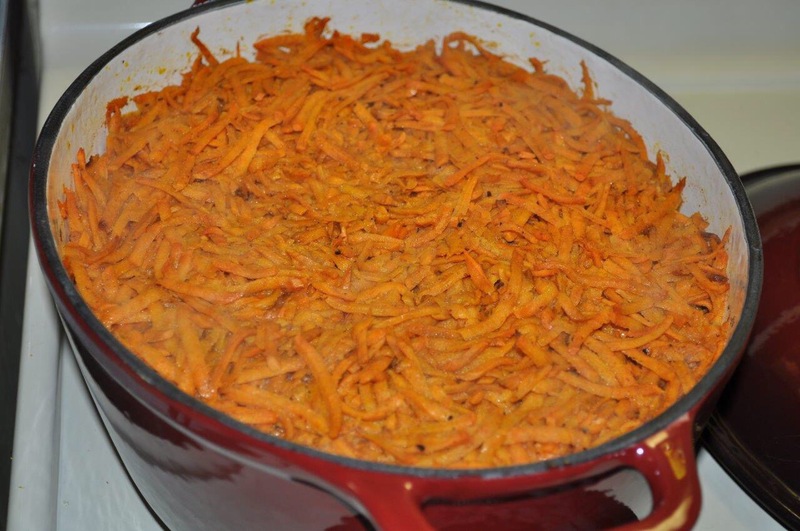 It is also a great dish to bring to a potluck. Cook quinoa 2 hours before preparing and let cool (I cooked 1 cup dry and saved remaining). Whisk dressing together and set aside. 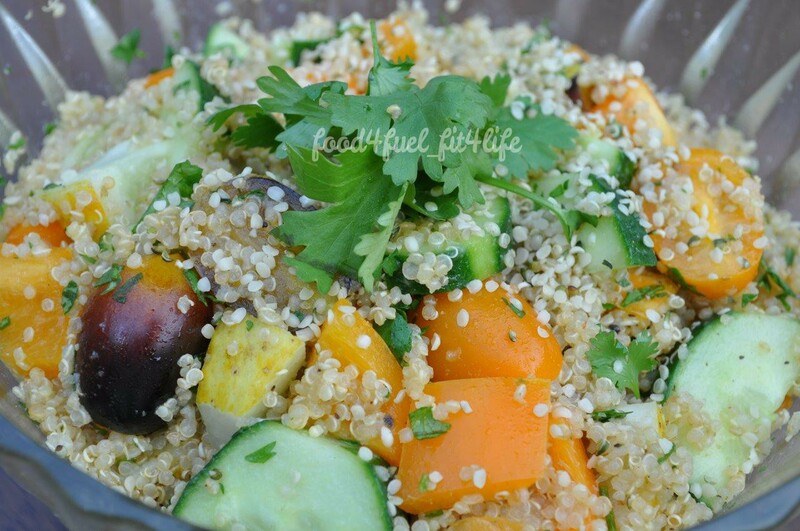 Prepare veggies and toss in large bowl, add cooled quinoa. 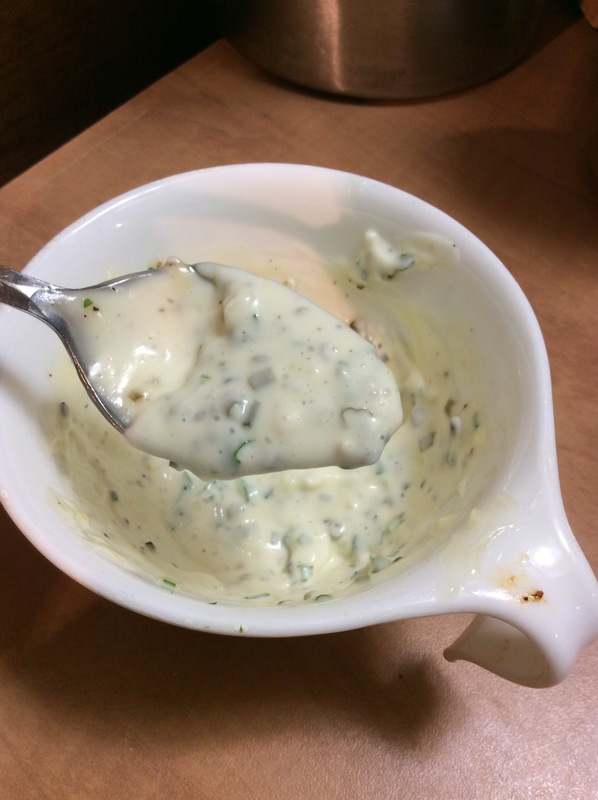 Pour dressing over salad and toss well. 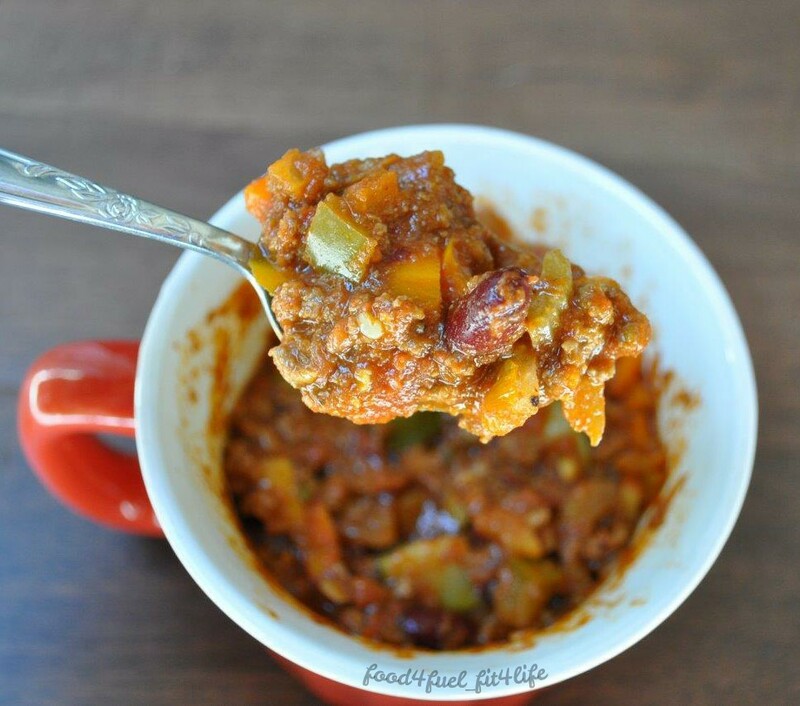 Place in fridge to let flavors develop for at least 20 minutes before serving. 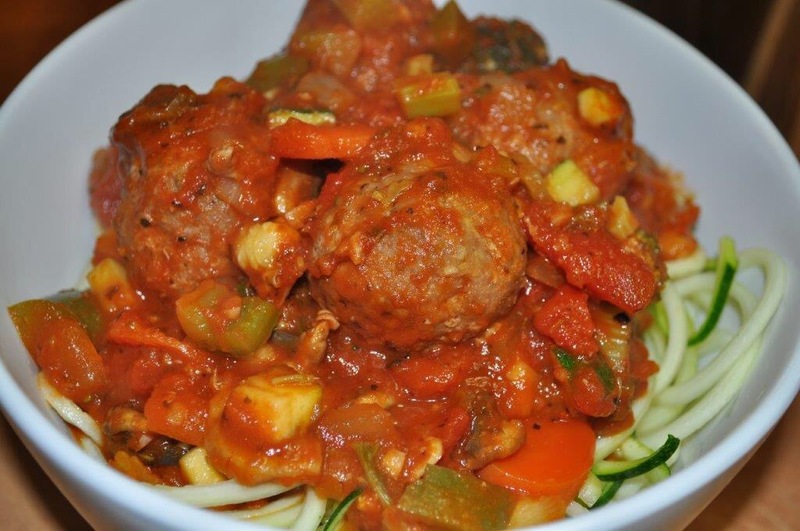 Leftovers can be stored for a few days in fridge. Wowzers this was a hit! 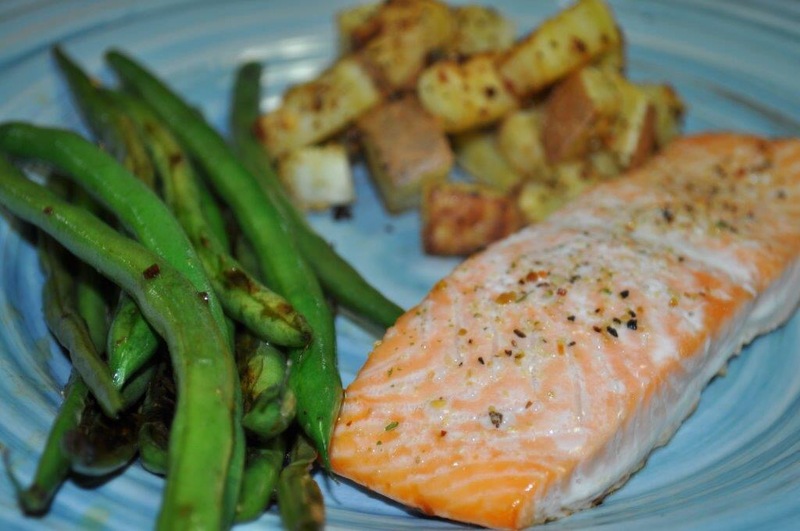 I love easy dinners and this was pretty easy to make. 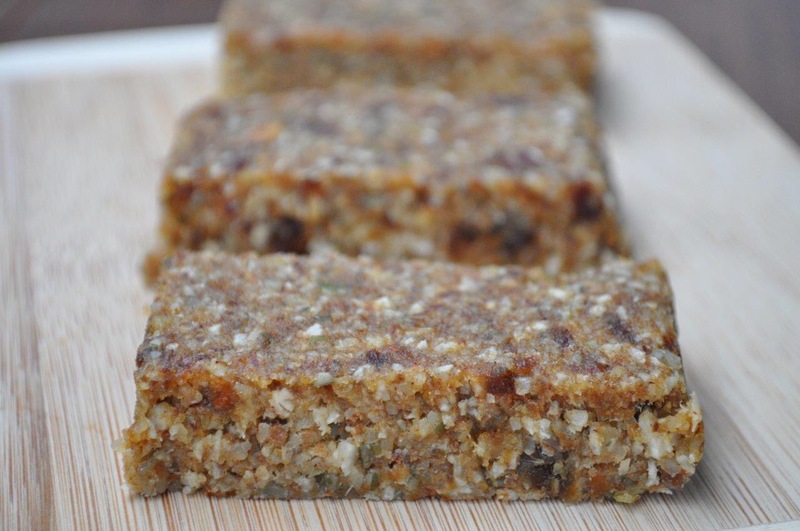 I adapted the recipe from Popular Paleo with few alterations. My version below. 2. 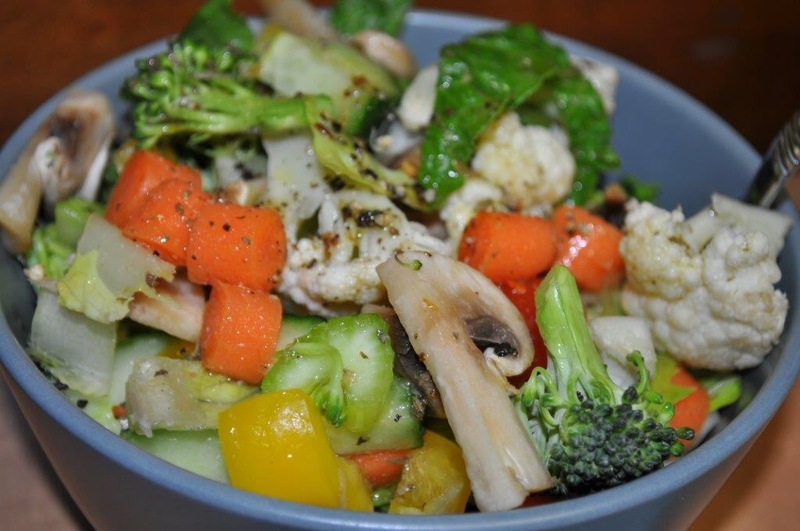 Chop all veggies, melt fat in large saucepan over medium heat and add all veggies except spinach. Sauté until just tender then add spinach and cook until spinach is wilted. 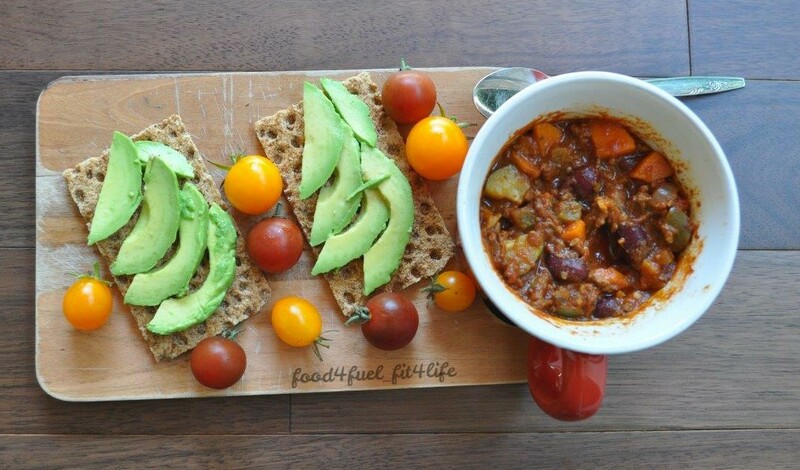 Remove veggies from pan and set aside. 3. 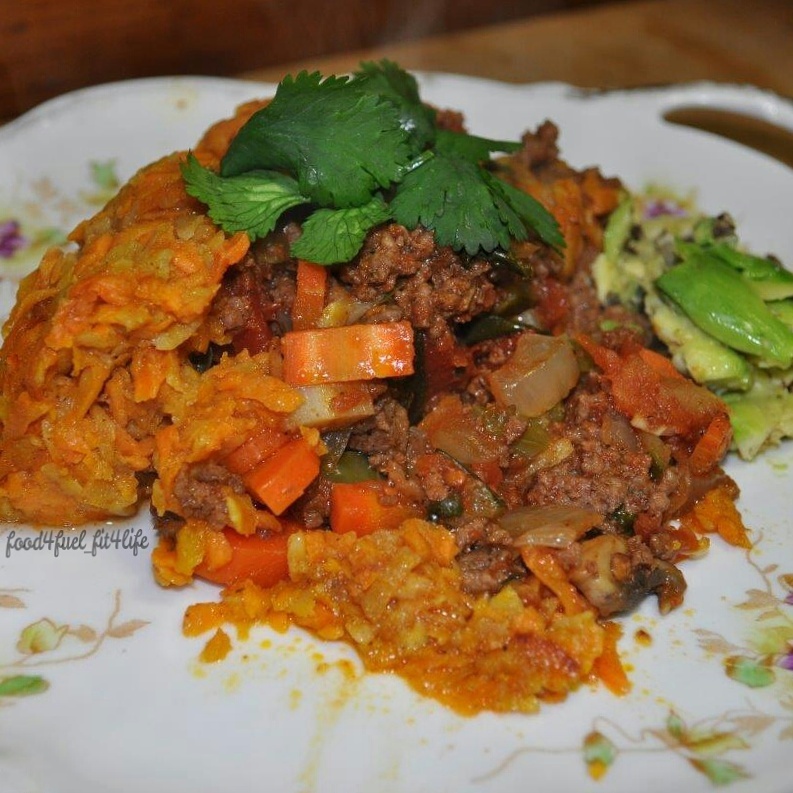 In same pan cook ground beef with taco seasoning until well done. 4. While ground beef is cooking peel and grate sweet potatoes (I used my handy food processor with the grating disk). 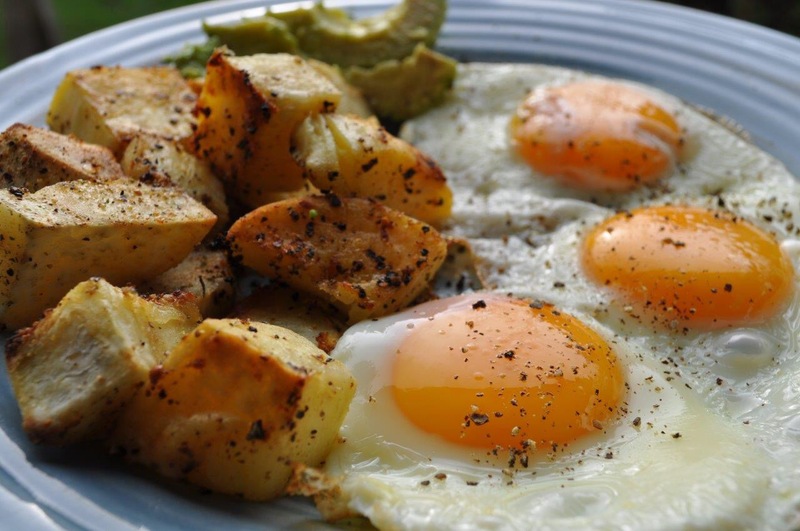 Immediately pour melted coconut oil over potatoes and toss with hands. Sprinkle the onion powder, chili powder, ground coriander and S&P over potatoes and toss until well combined. Set aside. 5. 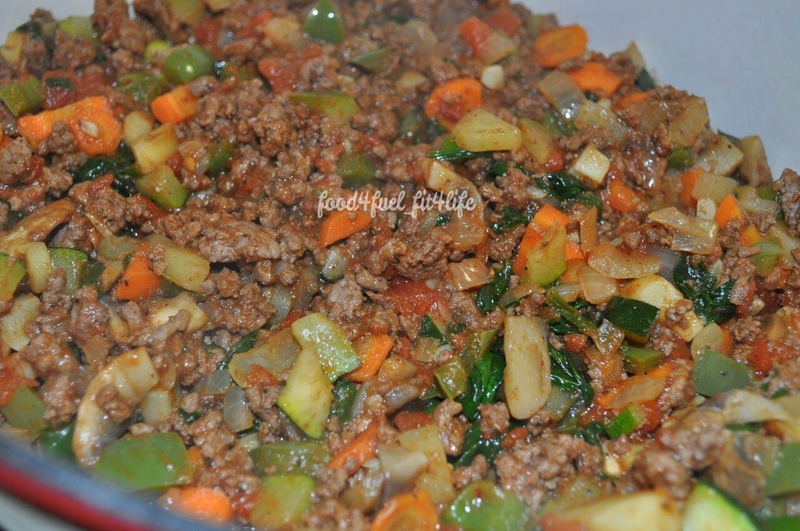 Once beef is done add the vegetable mixture and diced tomatoes to pan and cook for few more minutes to let flavors develop. 6. 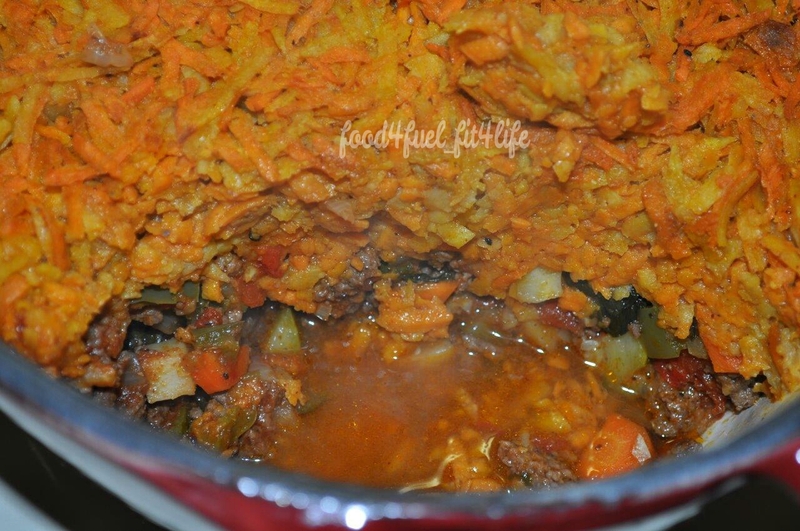 Transfer the veggie/meat mixture to a large baking dish (I used my dutch oven-you will need a pan at least 9×13″ big). 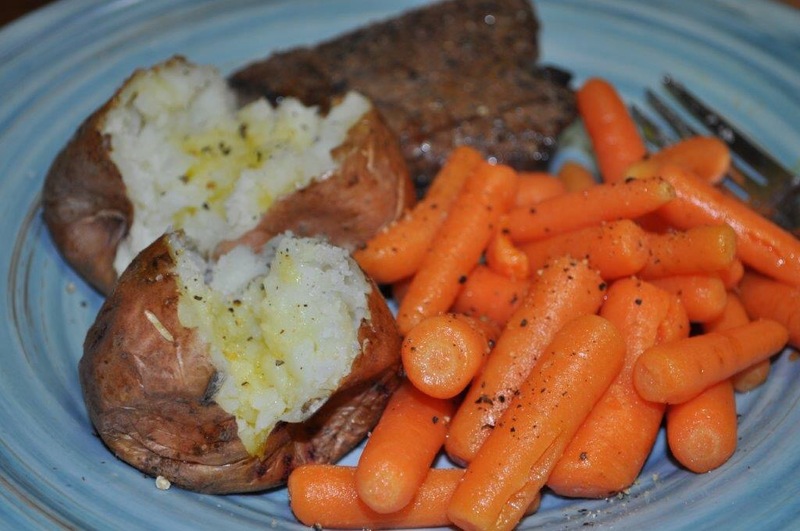 Top with seasoned sweet potatoes. 7. Cover and bake in preheated oven for 30min. 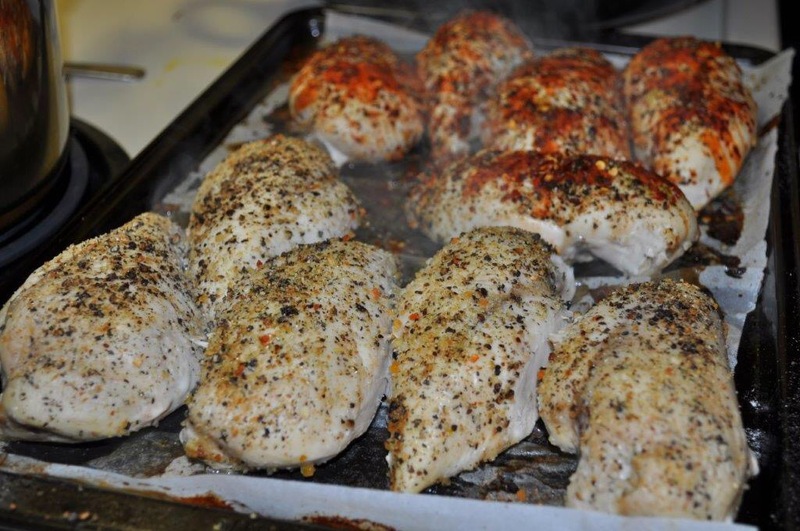 Remove cover and broil for 5min. Let stand 10min.